I know that it’s been quite some time since I have produced a voyage report for the website and for that I apologise. The last few months haven’t been the best following the break up of my relationship of three years. This has resulted in a lot of stress, both physical and financial and lets not forget the emotional anguish of actually separating and having to move house. This was immediately followed by some major changes in my work life as well. After working in the same building for 21 years the much promised relocation of my companies retail unit took place in May. It has taken a team of many people many hours to get this done and I won’t say it hasn’t been a stress free experience but we got there in the end. With the move we have had many things to learn, not just in the technology side of things but in the way we actually work. We have all been given new hours as well and they have certainly taken some getting used to but overall I am getting used to it. Following all this turmoil and upheaval my life has now started to settle down again and a routine is starting to emerge, which gives me more time to devote to the website once more. It’s strange, ferry travel and the website have always been my escape from the negative things that have happened in my life, it’s like my own personal lifeboat. However, this time around I didn’t want to bury myself in something I actually enjoy doing to the extent that it was no longer enjoyable. 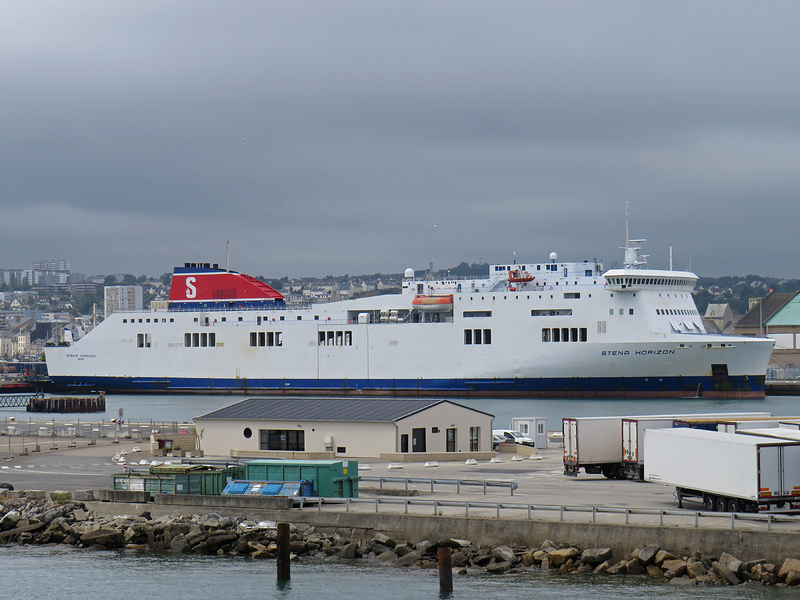 On Monday 4th June 2018 I embarked on yet another journey with Brittany Ferries to Normandy, this one, however was a little different to the norm as instead of traveling with my good friend and usual travel companion Paul Cloke, I was travelling with my uncle. 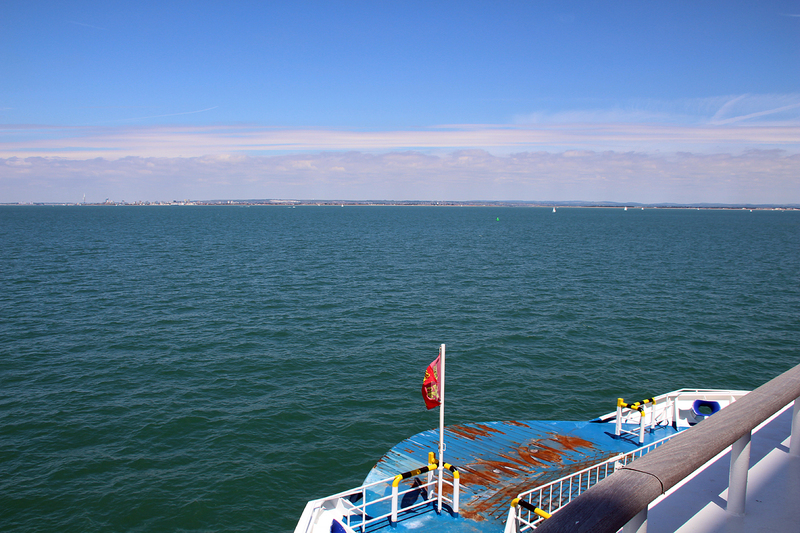 That in itself isn’t really shocking but when you consider that my uncle had never left the UK in his life, he had never been on a cross channel ferry and he had certainly never been to France, I have to say that I felt quite honored to be his guide for this historic journey. 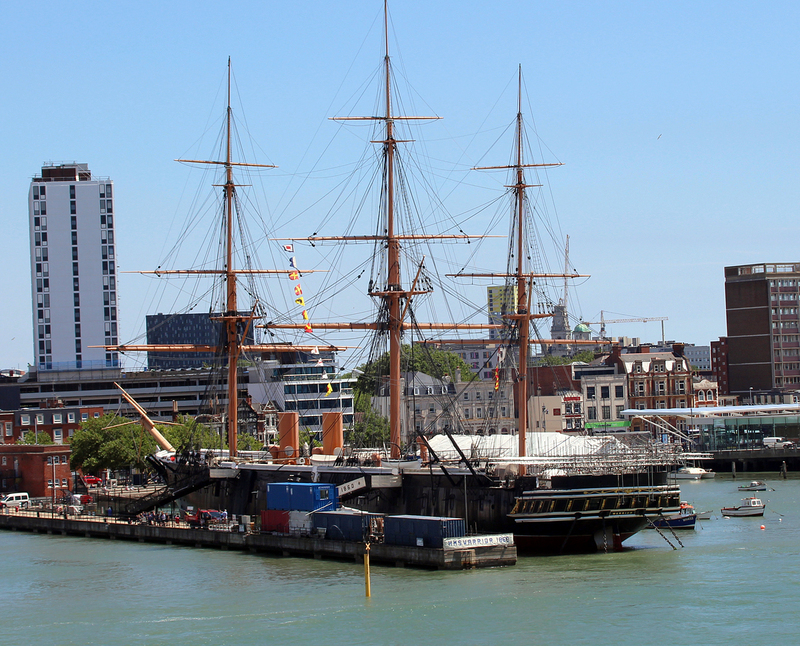 Photographs from our journey will be added to the website in due course but in the meantime I am going to mark my return to the website by detailing a multi trip journey that Paul Cloke and I undertook almost a year ago between Portsmouth and Le Havre, Cherbourg and Portsmouth and Portsmouth-Caen-Portsmouth. Paul and myself have already started planning a jaunt for later on in the year, so watch this space. 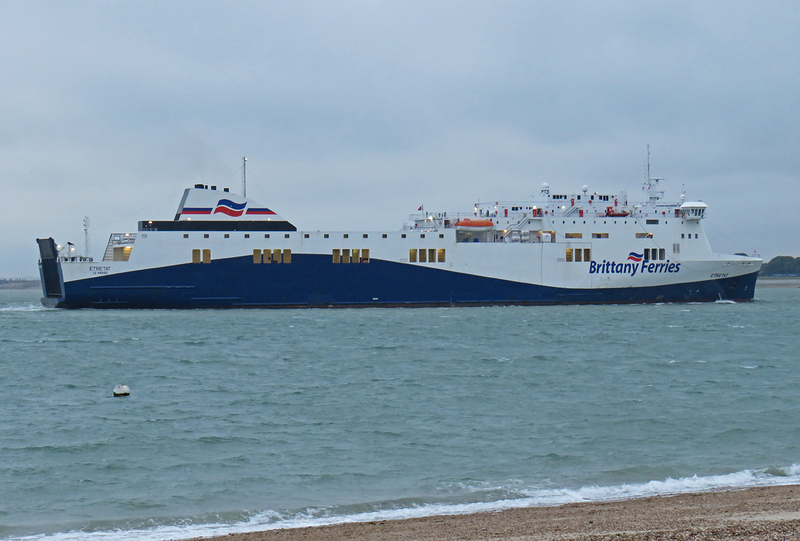 Whilst departing Portsmouth International Port in April 2017 there was a large billboard advertisement for Brittany Ferries describing the three principle elements of there current fleet operations from Portsmouth, these being économie, high speed and cruise ferry. 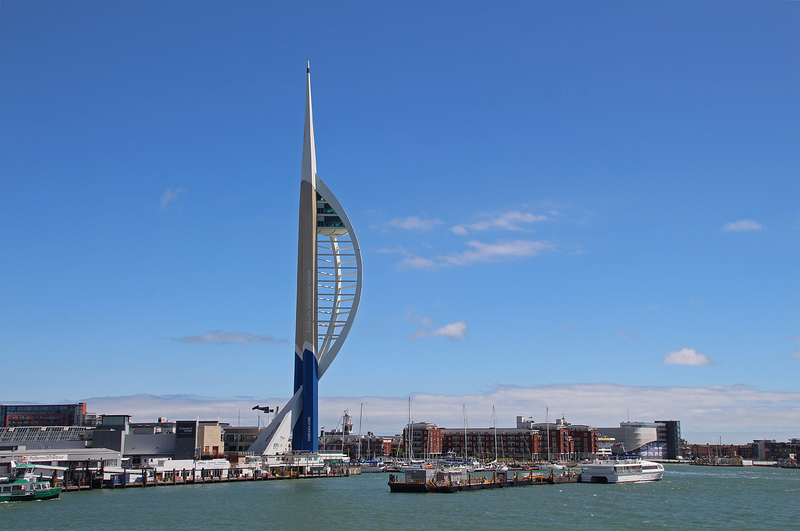 Following a flippant remark to Paul that this would make a good voyage report, low and behold we soon found ourselves back in Portsmouth doing just that! Our journey began on the 24th June 2017 and would see us travel out on the 23:15 overnight crossing from Portsmouth to Le Havre on the économie vessel Etretat. Upon arrival in Le Havre we would then drive to Cherbourg to catch the 12:30 high speed vessel Normandie Express back to Portsmouth. Following a few hours being tourists at Portsmouth historic dockyard it would then be on to the last element of our journey, the cruise ferry, in this case it would be the 22:45 overnight crossing of the Mont St Michel to Ouistreham followed by the 07:45 return crossing back to Portsmouth. The Etretat was built in 2008 by by C.N. “Visentini” di Visentini Francesco & C at the Porto Viro shipyard in Italy as one of a series of RoPax vessels ordered by Epic Shipping. Vessels of this class are collectively known within the shipping industry as the ‘Visentinis’. 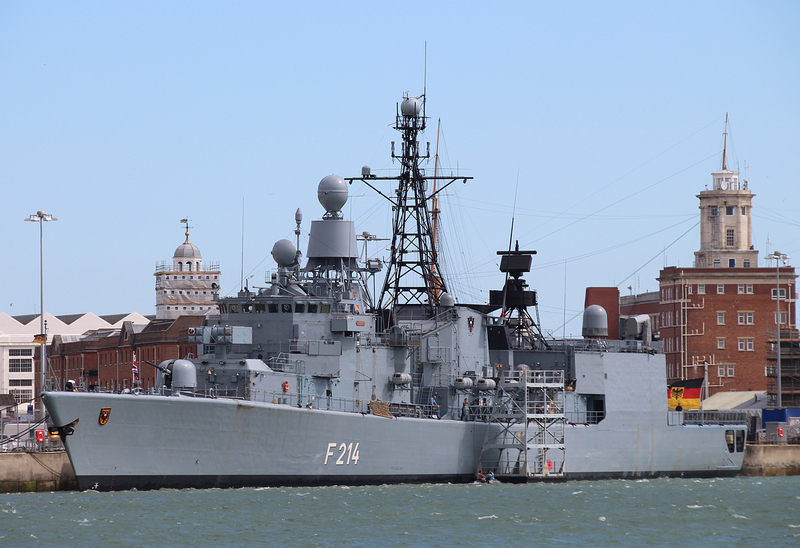 The Italian yard responsible for her construction have produced a number of these vessels (over 20) for operators worldwide. 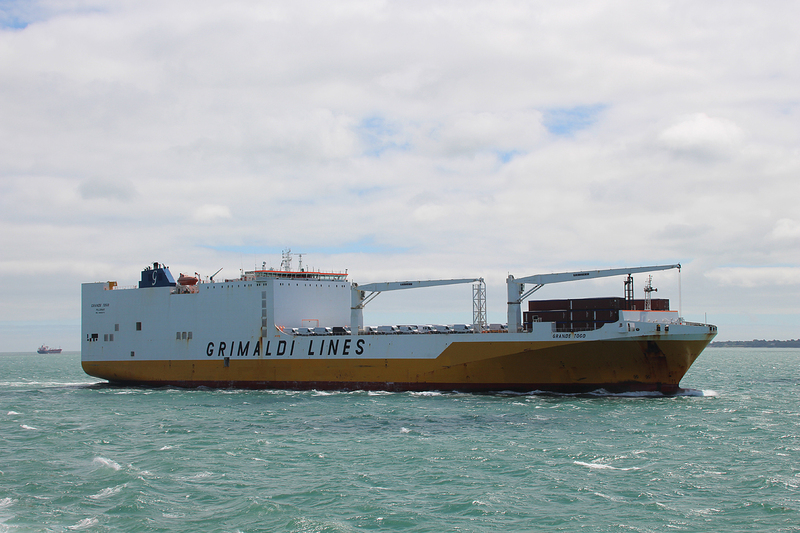 This class of vessel is well known for its freight capacity and its economical operation. 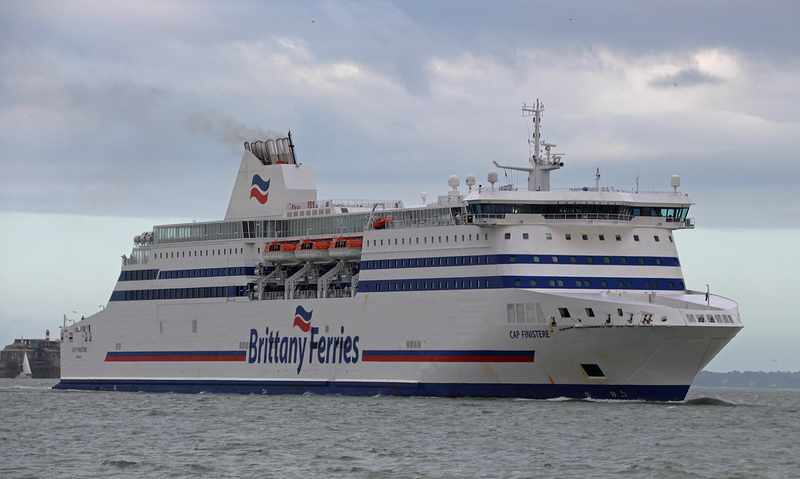 As you will see later on in this report there are a number of these vessels in operation with UK, Irish and French operators, including Brittany Ferries, Irish Ferries and Stena Line. Upon completion and delivery the vessel was chartered to the French ferry operator LD Lines and was christened Norman Voyager. 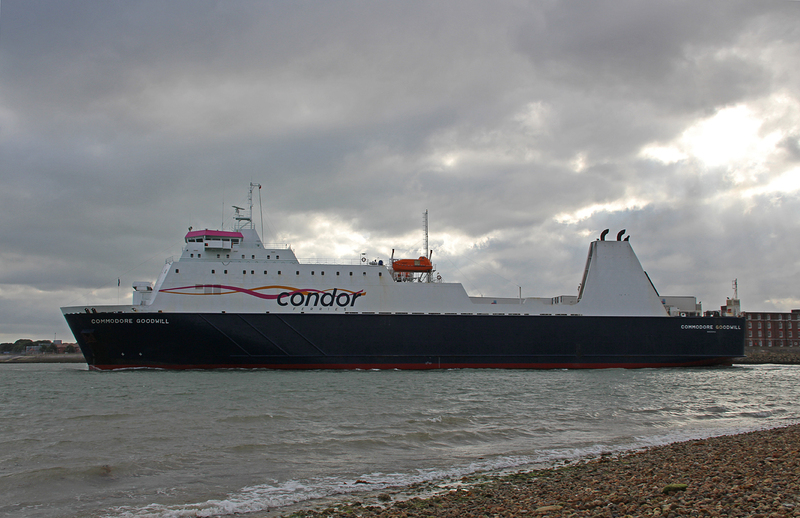 She was introduced on to the Le Havre-Portsmouth route on the 6th November 2008 and joined the routes other vessel the Norman Spirit. 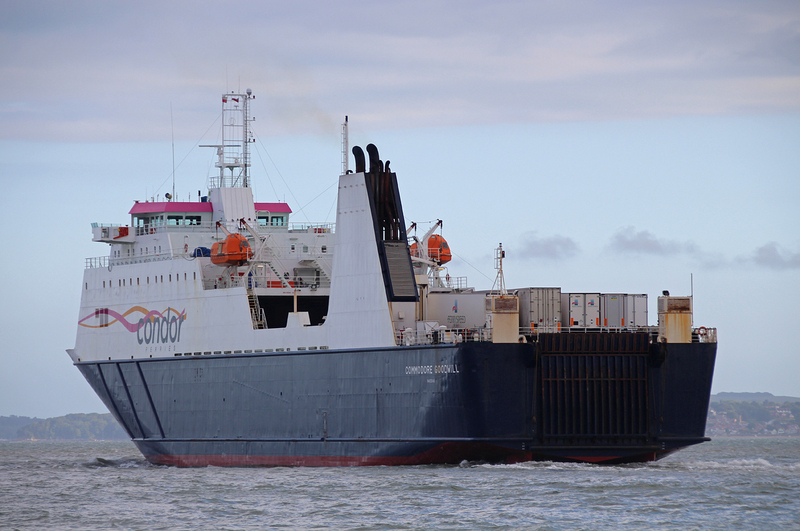 As well as operating to France the vessel also launched a new weekend service from Le Havre to Rosslare in Ireland. In September of 2009 the Norman Voyager was replaced in the LD Lines fleet by the high speed vessel Norman Arrow. 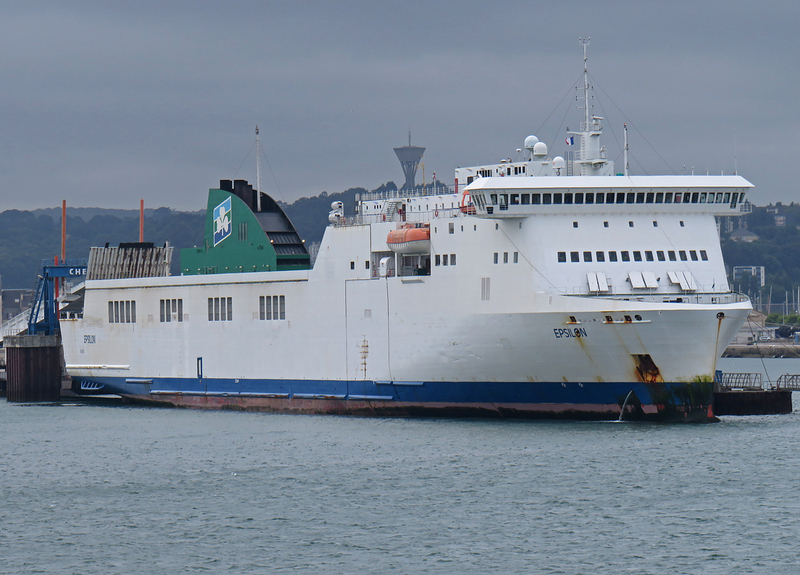 She was subsequently chartered to Celtic Link Ferries for service between Cherbourg and Rosslare. 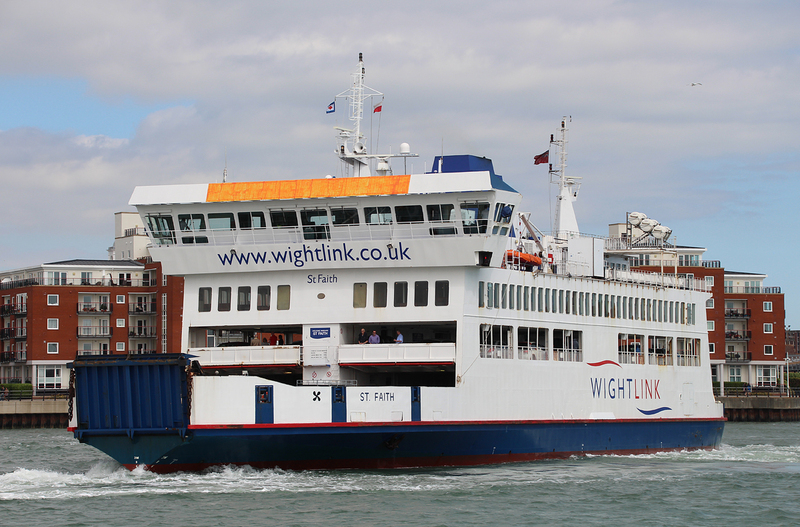 In November 2011 the Norman Voyager returned on charter to LD Lines, initially operating between St Nazaire and Gijon before returning to the Le Havre to Portsmouth route in December of 2011. 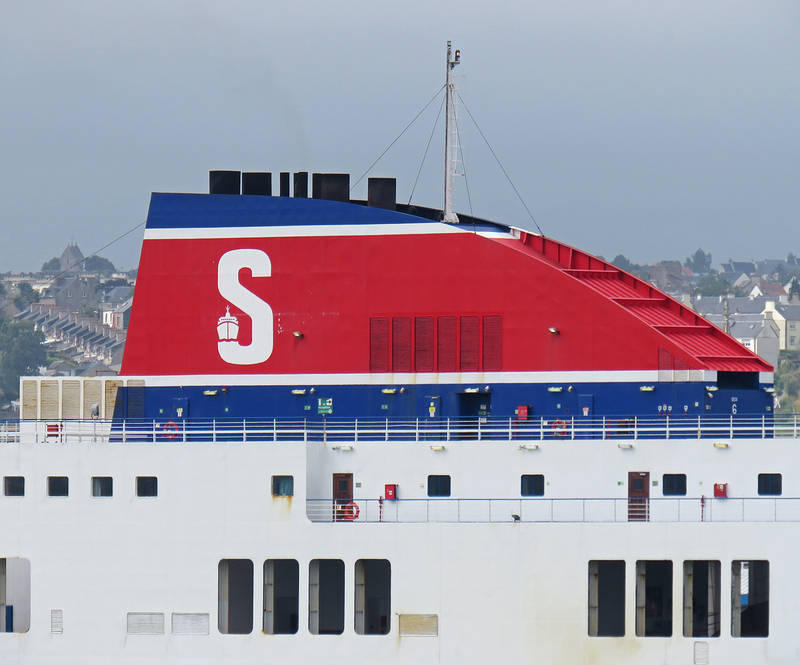 In April 2012 the ownership of the vessel changed from Epic Shipping to Stena RoRo, however, the Norman Voyager remained on charter to LD Lines. 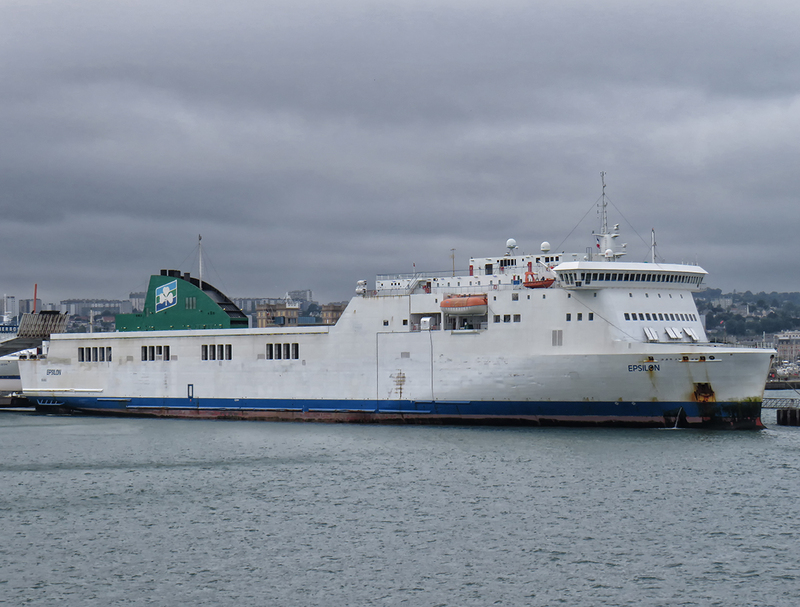 In October 2013 she conducted berthing trials at the port of Poole in anticipation of her sister vessel the Norman Asturias (now Brittany Ferries Connemara) opening a new route from Poole to Santander. 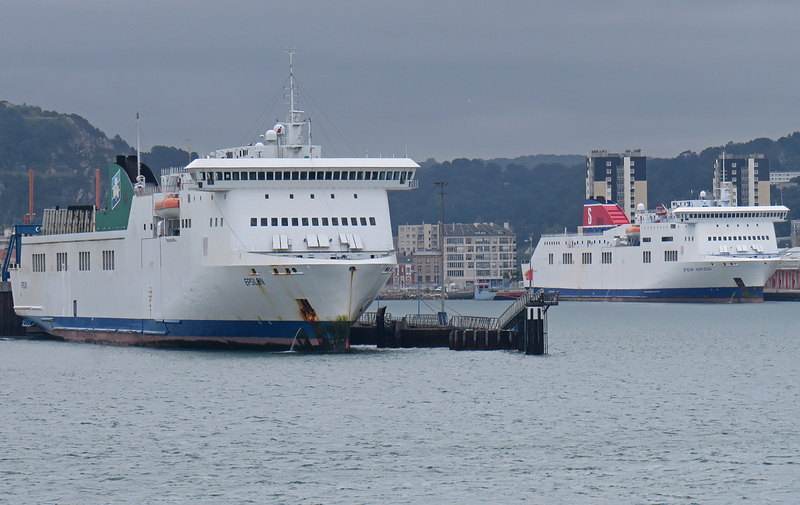 At the time of her visit she was the biggest ferry to have ever docked at the Dorset port. 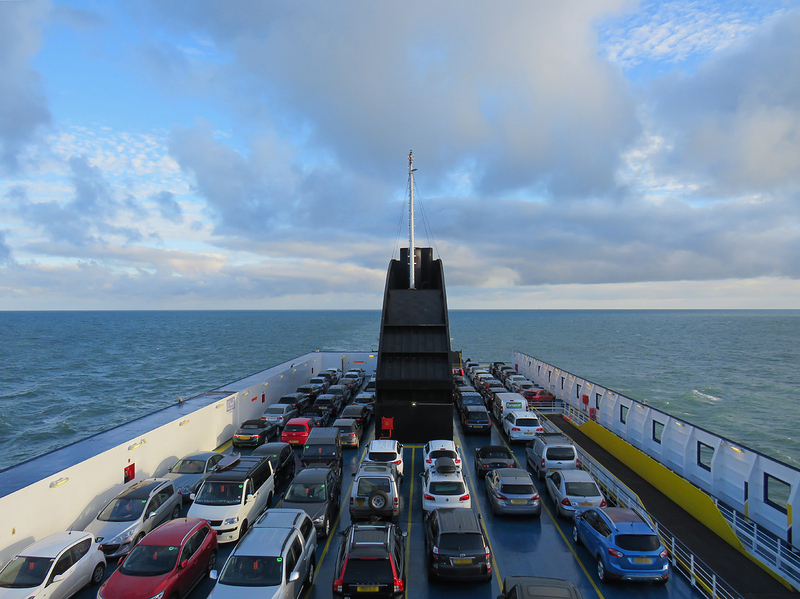 During 2013 LD Lines Portsmouth to Le Havre, Newhaven to Dieppe and their share of the Dover to Calais operation were transferred to a new joint venture with DFDS. DFDS Seaways own Dover to Dunkirk operation was also included in the transaction. The new company known as DFDS Seaways France were now responsible for the operations on the Portsmouth to Le Havre route. 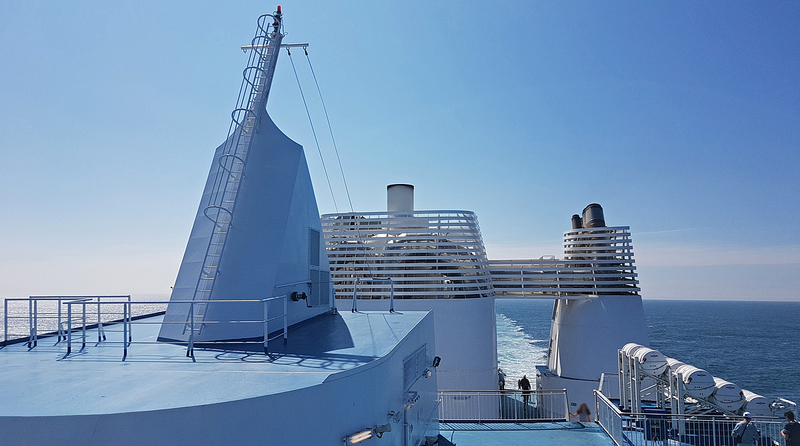 In late 2014 LD Lines parent company, Louis Dreyfus Armateurs, sold their remaining shares in the DFDS Seaways France joint venture to DFDS with the venture became fully integrated into the DFDS group. 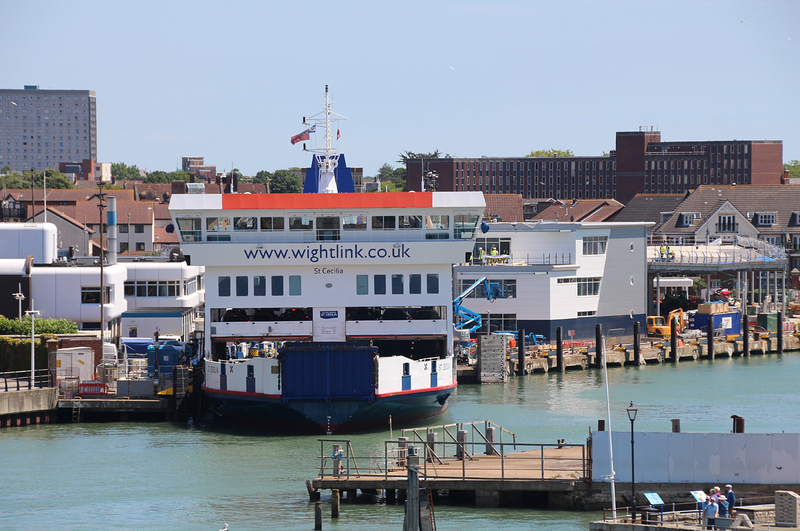 In March 2014 the Norman Voyager was replaced on the Le Havre to Portsmouth route by the then spare Newhaven to Dieppe ferry Seven Sisters. 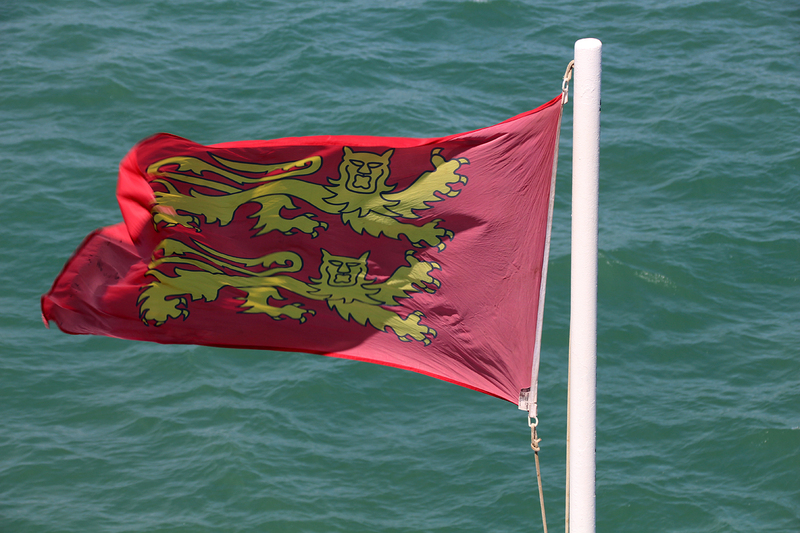 From the 11th March 2014, the Norman Voyager was chartered to Brittany Ferries. 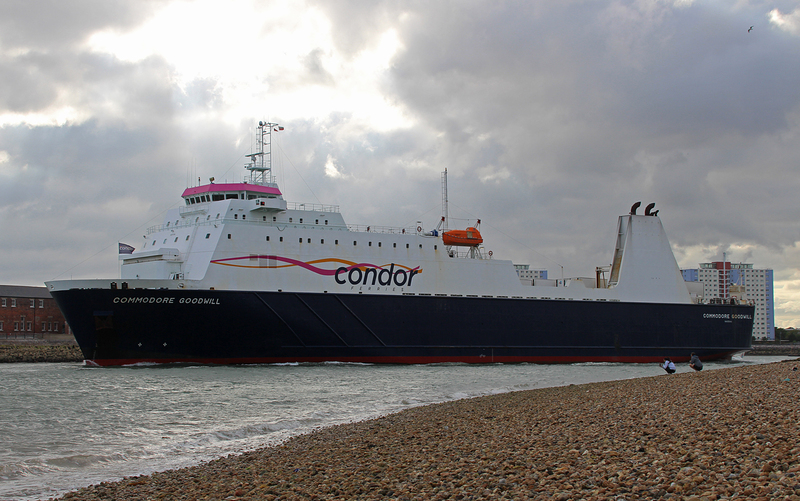 She was renamed Etretat and rebranded for the companies new économie service from Portsmouth to Le Havre and from Portsmouth to Santander. 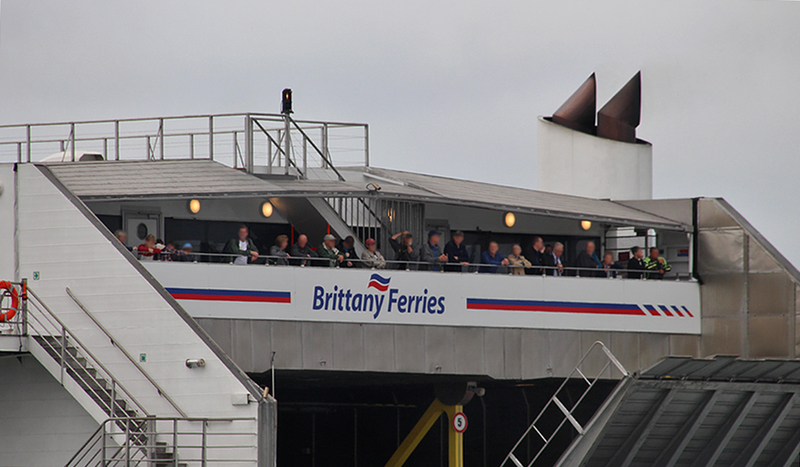 The name chosen for the vessel followed Brittany Ferries tradition of naming ships after local areas. Etretat is a town situated about 20 miles north-east of Le Havre and is best known for its chalk cliffs, including three natural arches and a pointed formation called L’Aiguille or the Needle, which rises 70 metres (230 ft) above the sea. These cliffs and the associated beach resort have attracted many artists including Eugène Boudin, Gustave Courbet and Claude Monet. 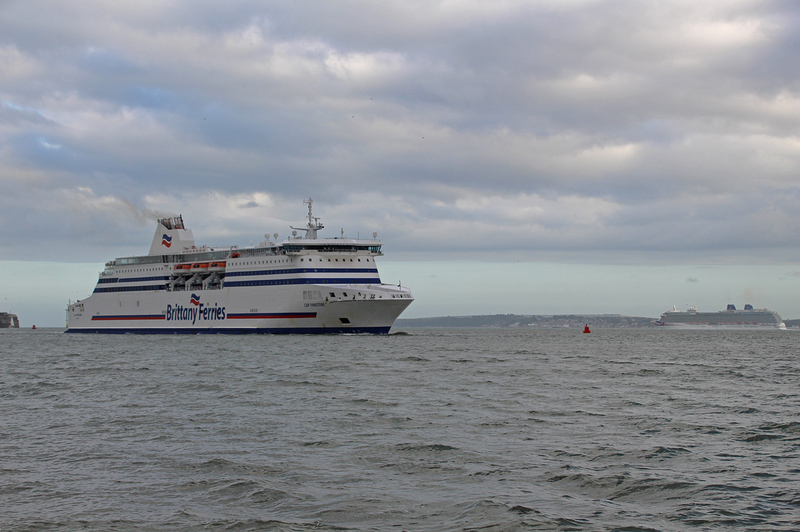 On the 30th of December 2014 DFDS closed there Le Havre-Portsmouth route. The company stated that the daily service to Normandy had carried 185,000 passengers in 2013 but it had been losing money for some time. It also stated that cost-cutting measures that had been put in place in 2012 had had a very limited effect and with the prospect of higher fuel costs to comply with tougher EU limits on sulphur emissions from 2015 it meant the route did not have a viable future. Having completed work at 18:00 after a 12 hour shift there wasn’t much time to travel the 120 miles to Portsmouth but the roads and more surprisingly the M25 were very kind to us. 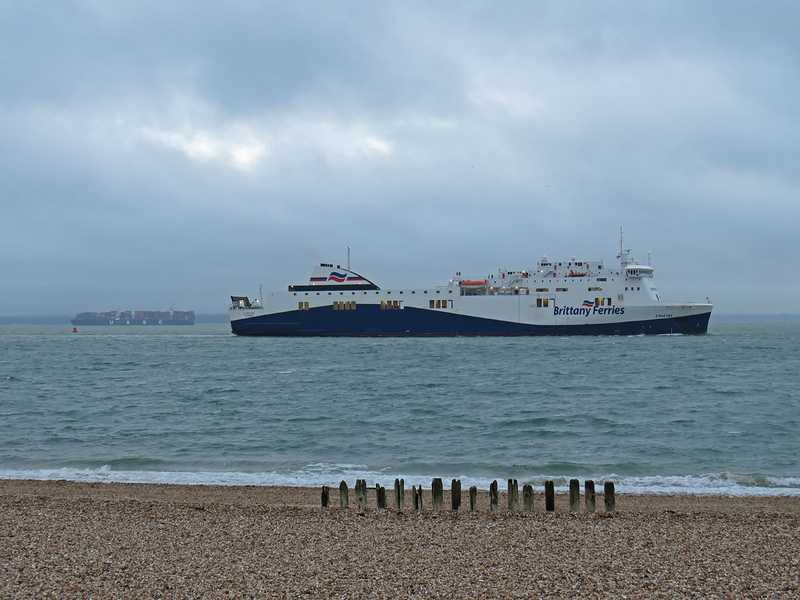 We arrived on the seafront at Southsea at 21:00, just in time to see the arrival of the Etretat from Le Havre. With a bit of time to kill before our 23:15 sailing we had a walk along the seafront before heading into town to get a bite to eat. 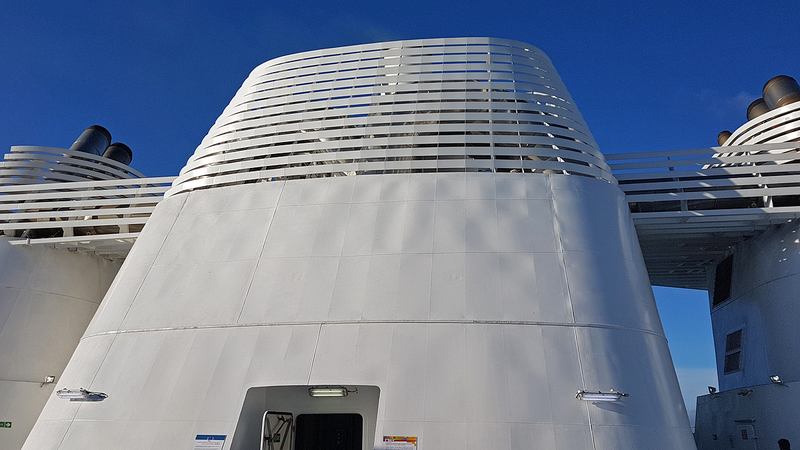 There are around 111 cabins onboard the Etretat, 13 of these being pet-friendly cabins. Cabin accommodation onboard can sometimes be rather limited but the ship does have two large reclining seat lounges available. Unlike the rest of the fleet where your boarding card acts as your cabin key, on the Etretat you have to punch a four digit pin number into the lock to get the cabin door open. Yes the cabin is uncarpeted but it was spacious and as I have found previously on this class of vessel, the beds are very comfortable. 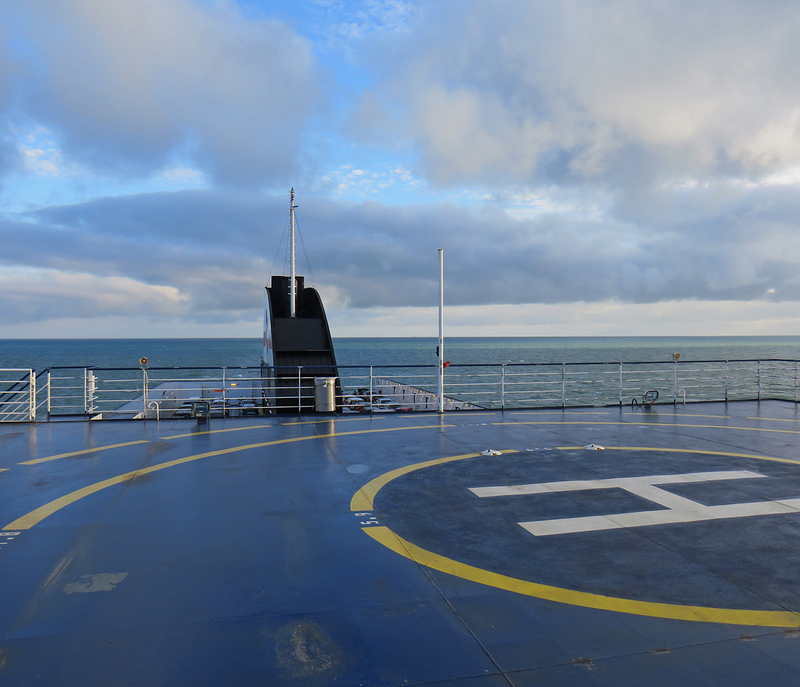 After a very comfortable night’s sleep (I think the previous days 12 hour shift followed by the journey to Portsmouth had helped) it was time to get up before our scheduled arrival in Le Havre. 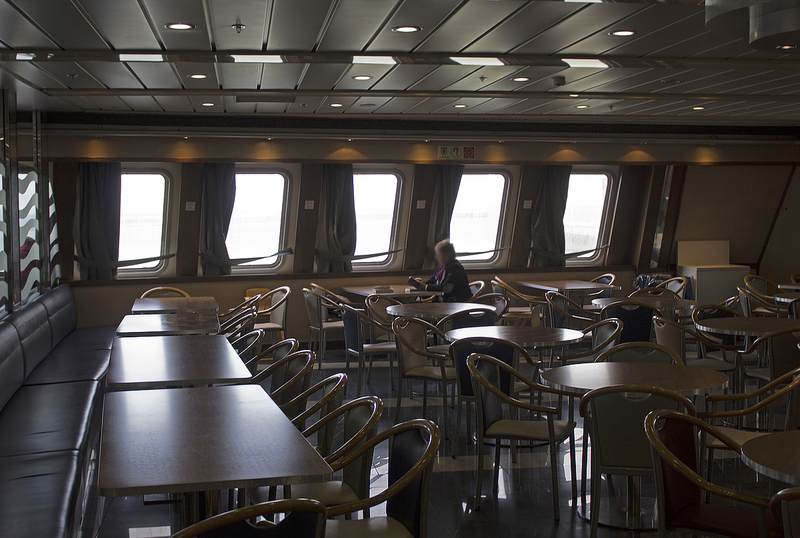 With the majority of the ships passengers still sleeping it was time to have a wander around the relatively quiet vessel for some internal photography followed by a spot of breakfast. Like all the other ships in the Brittany Ferries fleet a full English breakfast is available but I opted for the freshly baked French pastries and a strong coffee. 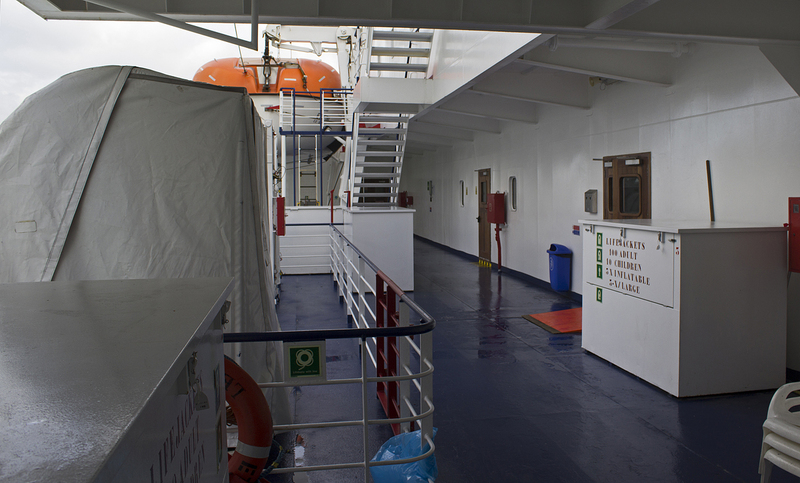 This is an open deck area giving clear views to both port and starboard and astern across the upper car deck of the vessel. A number of plastic deck chairs are available for use here on sunnier days. Tt may look nice in the photos but it was cold, certainly not weather for shorts at least. 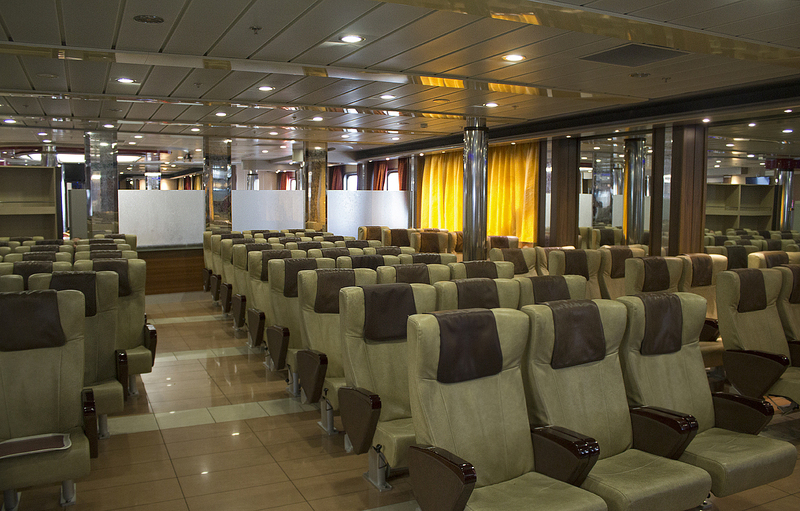 This deck consists of cabins. There are 111 in total, 13 of them being pet-friendly cabins. 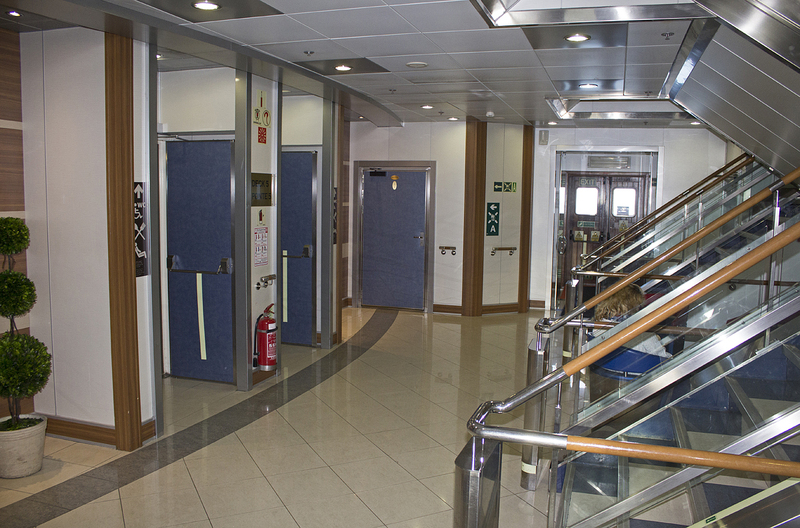 Pets and their owners can enjoy a stroll in there own dedicated pet exercise area at the rear of deck 6. 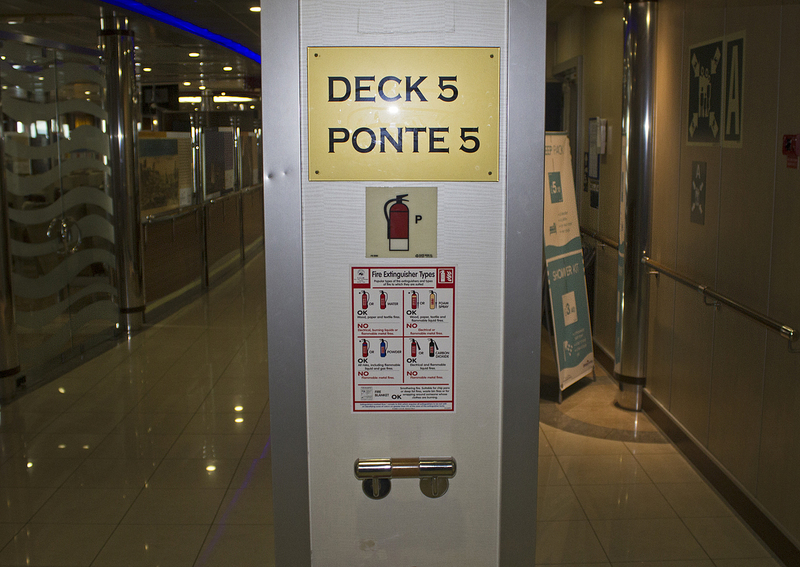 It’s worth noting that there isn’t a lift between decks 5 and 6. 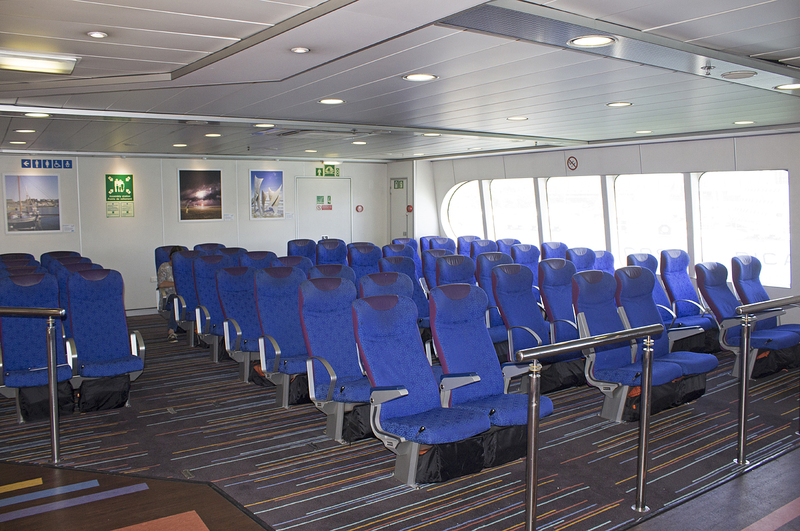 This is the main passenger deck with step free access from the open car deck. 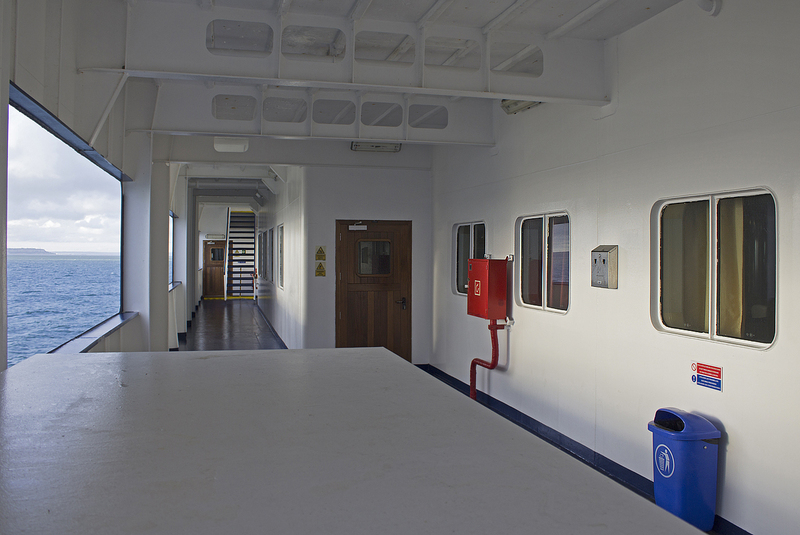 From the stern of the vessel there is a covered walkway leading from the lift and stairs to the forward accommodation block. 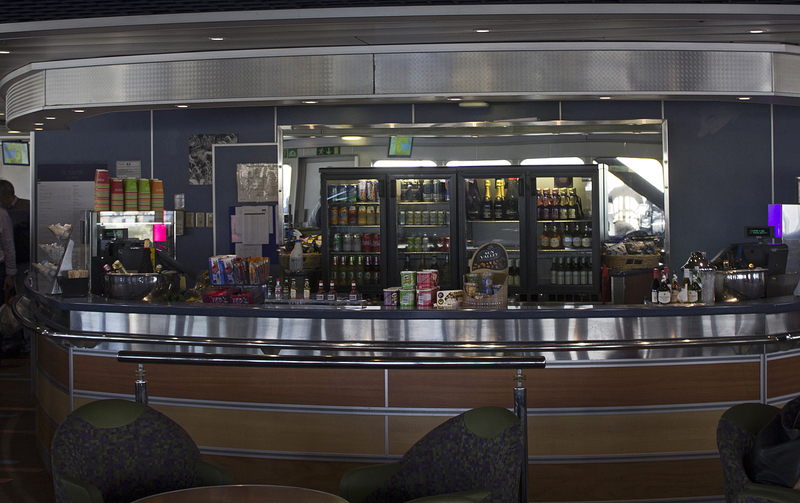 Forward of this on the starboard side is the Le Bar with it’s adjacent seating area to port. 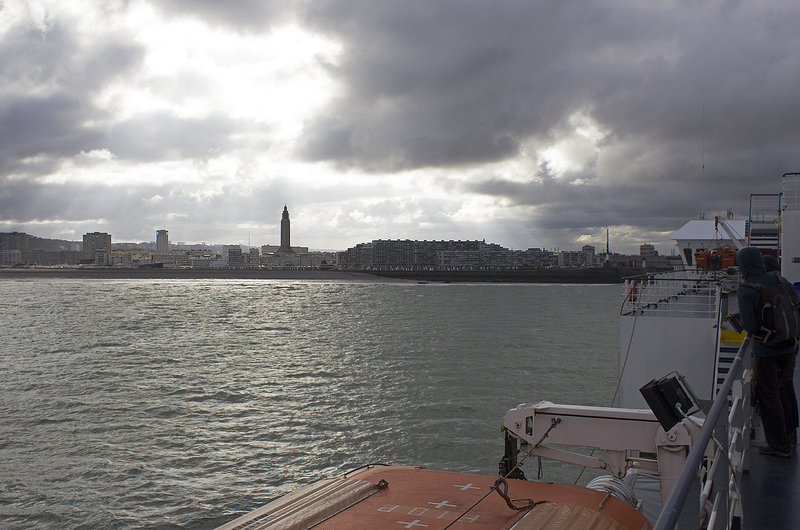 After a relaxing crossing we were soon berthing in Le Havre at 08:15 local time. From here we had roughly three hours to get to Cherbourg for our return crossing to Portsmouth onboard the Normandie Express. 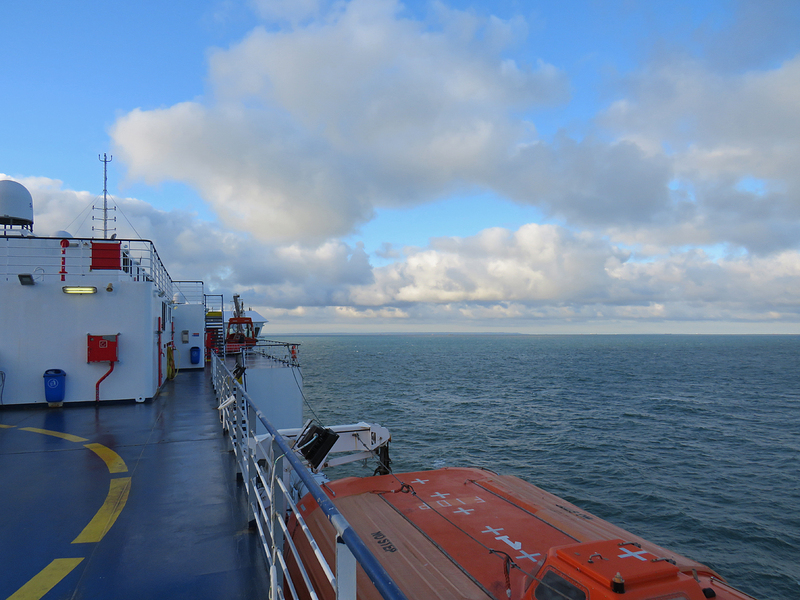 It has to be said that we usually take a very leisurely pace between our arrival and departure ports but on this occasion we had 130 miles to travel and not knowing if there would be any road issues we decided to get a move on. 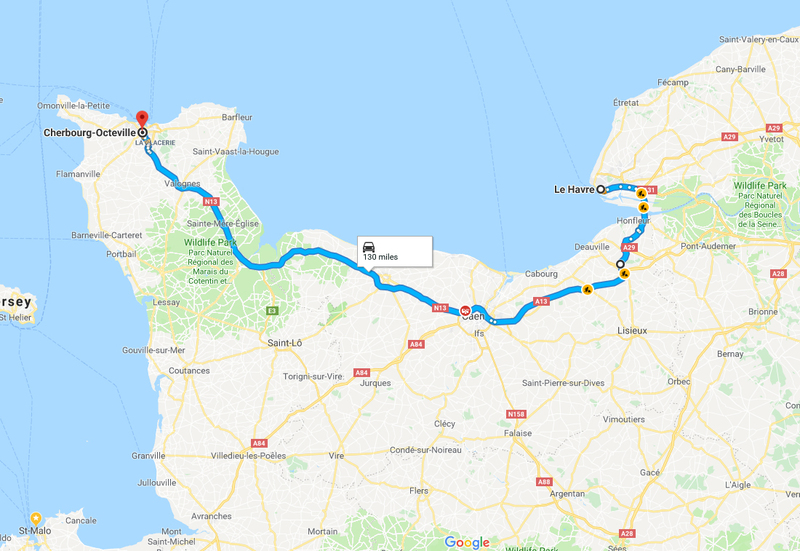 Our route would take us east from Le Havre before heading south over the mouth of the River Seine on one of Europe’s longest bridges, the Pont de Normandie. 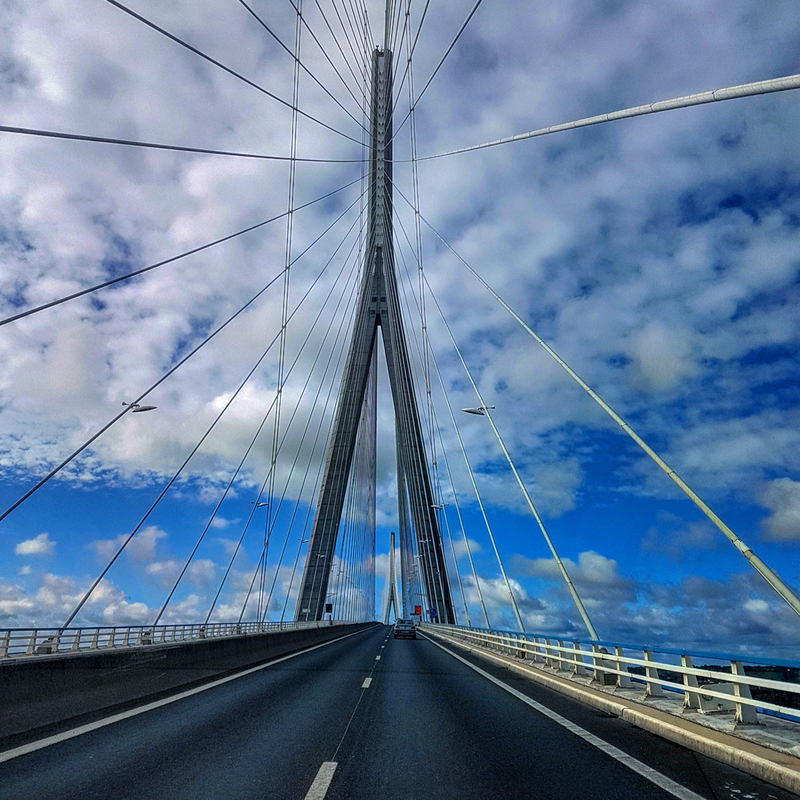 The Pont de Normandie is a cable-stayed road bridge that spans the mouth of the Seine linking Le Havre on the north bank to Honfleur on the south bank. 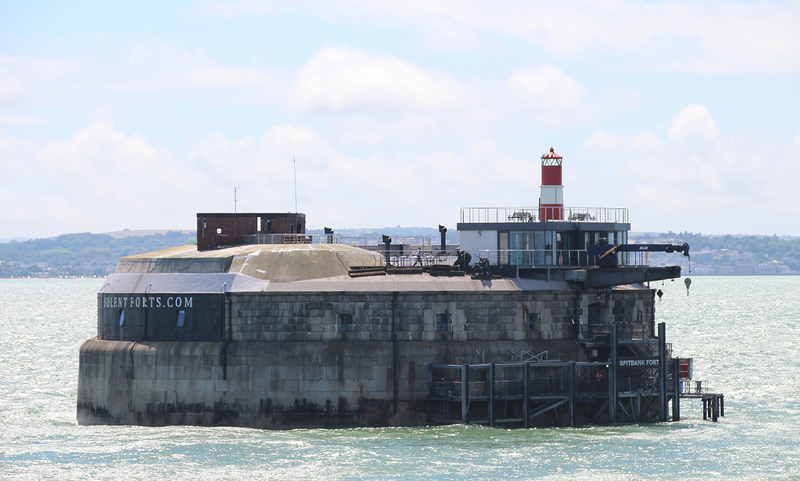 It has a total length of 2,143.21 metres (7,032 ft) – 856 metres (2,808 ft) between it’s towering piers. It is also the last bridge to cross the Seine before it drains into the Channel. Despite being a motorway toll bridge, amazingly there is a footpath as well as a narrow cycle lane in each direction allowing pedestrians and cyclists to cross the bridge free of charge (rather them than me). The cost of crossing the bridge is €5.40 and it is well worth mentioning at this point that we were on Toll routes until we reached the ring road around Caen (called the ‘Périphérique’). 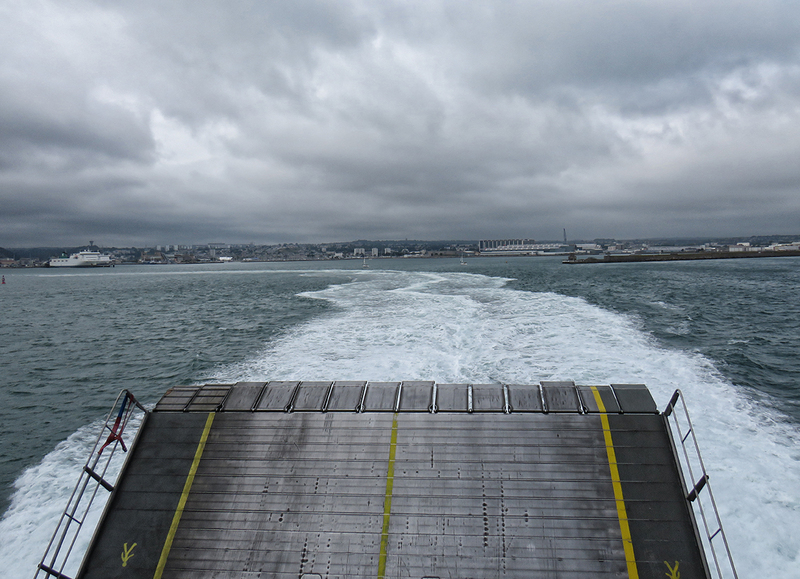 The total cost of our journey from Le Havre to Caen was around €10.00. The route west into what was Lower Normandy and up the Cotentin peninsula didn’t incur any toll costs. After crossing the Pont de Normandie our route took us west around the city of Caen before passing to the south of Bayeux and continuing westwards towards the town of Carentan. From here we headed north up the Cotentin Peninsula passing Ste-Mère-Eglise and Valognes before arriving in Cherbourg. One thing that was noticeable on our journey west was that the weather had closed in somewhat with a steel grey sky and a noticeable increase in wind speed. Whilst thinking about all the times I have visited Cherbourg in recent years I think I have seen sunshine just the once (I am starting to think it’s me). 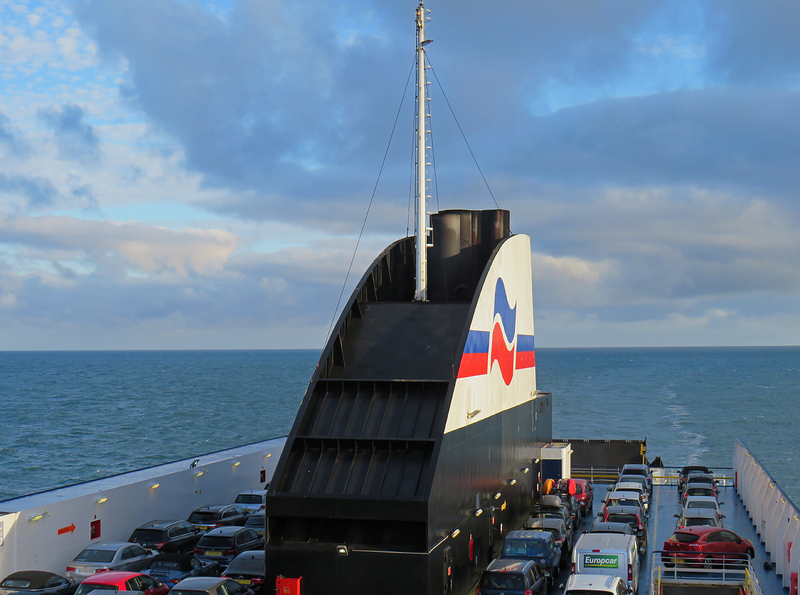 The journey westwards took around 2 hours and we reached the Brittany Ferries check-in with time to spare and following security checks we were soon driving onboard the Normandie Express for Trip Two – High Speed. The Normandie Express is an aluminium ‘Evolution 10B’ series catamaran built in the year 2000 by Incat (International Catamarans) in Hobart, Tasmania as a car and passenger ferry. She was ordered for the charter market and was delivered to Incat Chartering in August 2000 as the Incat Tasmania. On the 3rd August 2000 she transported the Olympic Torch around the coast of Tasmania as a part to the buildup to the XXVII Olympiad which was to be held in Sydney, Australia from the 15th September 2000 to the 1st October 2000. On the 9th September 2000 she was chartered to the Australian Trade Commission and was laid up in Sydney to act as a floating conference centre on behalf of the ‘Business Club Australia’ during the course of the Olympic Games. In November 2000 it was announced that the vessel would be chartered to Tranz Rail of New Zealand for there Interislander service across the Cook Strait between Wellington and Picton. Renamed The Lynx she entered service in December 2000 and served the route until July 2003. Upon completion of her charter she returned to the Incat yard in Hobart, Tasmania. 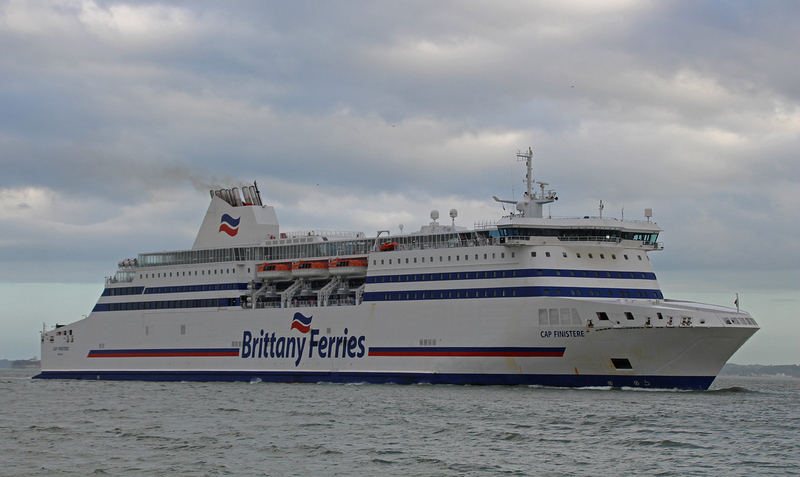 In December 2004 it was announced that the vessel would be chartered to Brittany Ferries and would be renamed Normandie Express. 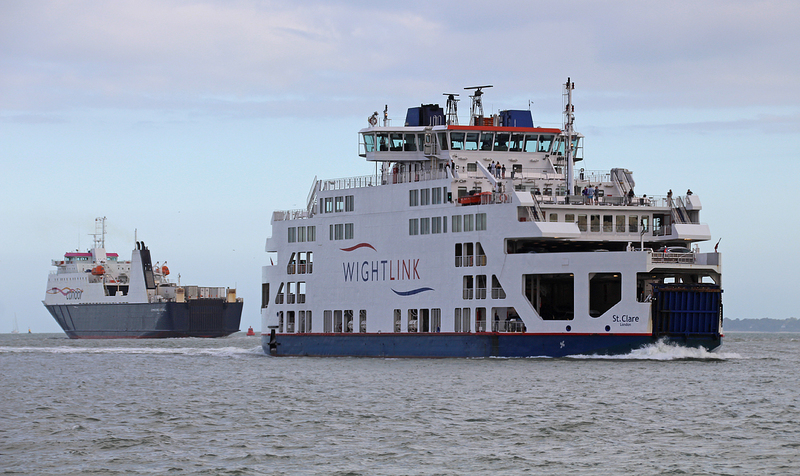 The ship had been acquired to open two new seasonal high speed services from Portsmouth to the Norman ports of Caen (Ouistreham) and Cherbourg. The Normandie Express would operate from mid-March until mid-November with crossing times of 180 minutes to Cherbourg and 225 minutes to Caen (Ouistreham), running up to two return trips a day to Cherbourg and a daily service to Caen (Ouistreham) every Friday, Saturday and Sunday supplementing the three return crossings a day made by the conventional cruise-ferries Normandie and Mont St Michel. The Normandie Express departed Hobart on the 22nd January 2005 bound for France. It was announced that she would be taking a detour to Indonesia with a vital shipment of aid for the survivors of the Indian Ocean Tsunami which had occurred on Boxing day 2004. The ship was ferrying desperately needed aid items which had been donated for the victims of the disaster and she would unload the much needed supplies in Jakarta before continuing on to France in readiness for her debut on cross channel fast ferry service. Included in the aid shipment were 80 pallets of bottled drinking water, 320 large tents capable of accommodating up to 2500 people, several donated Four Wheel Drive vehicles including a fire truck, 40 sewage treatment systems, medical supplies, bedding items, baby food and other non-perishable food items. In addition to the vital aid shipment, the high speed catamaran was also returning to France the stricken yacht Sill et Voilia which in December 2004 was forced to withdraw from the Vendee Globe solo round the world race after suffering severe keel damage. On the 15th March 2005 the Normandie Express commenced seasonal services between Ouistreham – Portsmouth and Cherbourg – Portsmouth. 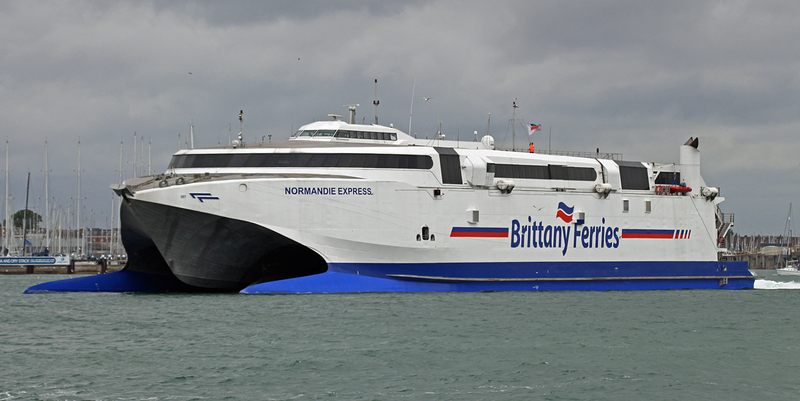 In March 2007 the Normandie Express was purchased by Brittany Ferries from Incat. 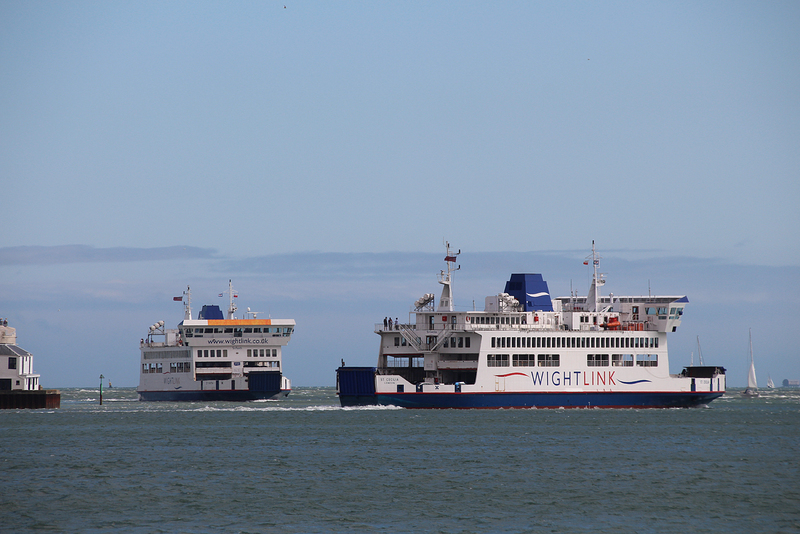 Although used primarily on routes from Portsmouth the vessel has seen service on some of the companies other routes, these being, Plymouth-Roscoff (Spring 2008) and Poole-Cherbourg (Spring 2015). 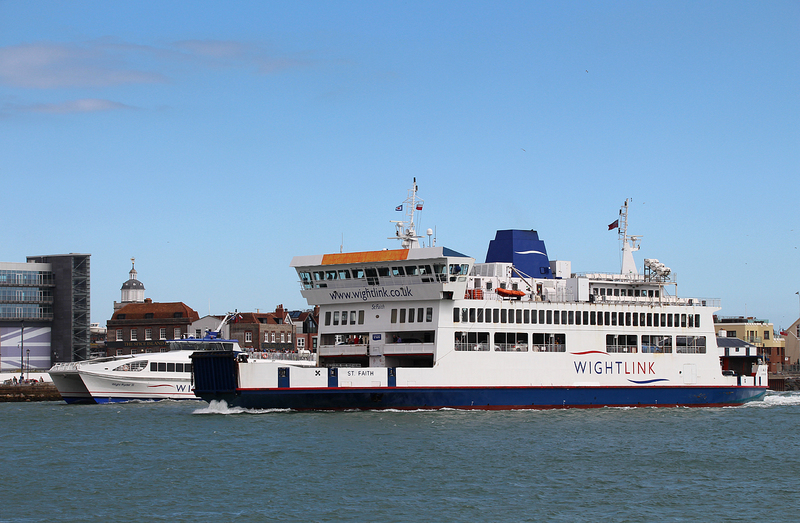 In 2013 the craft was used to inaugurate a new service linking Portsmouth with Le Havre. 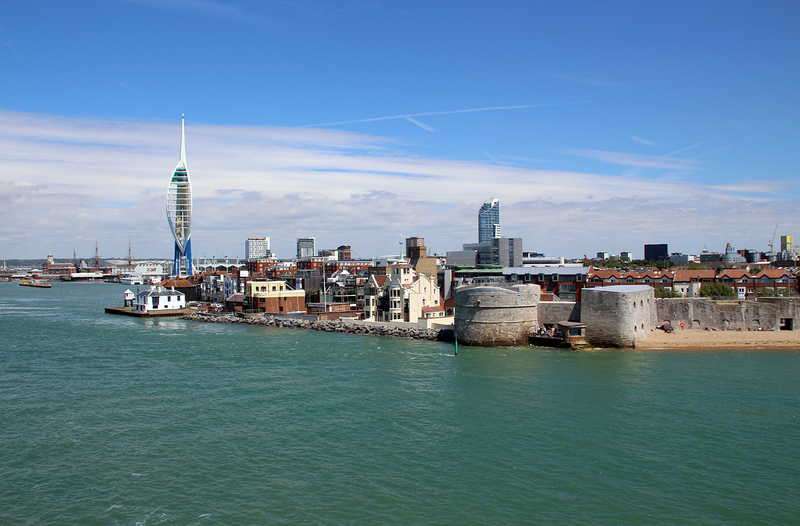 Today the Normandie Express can be found serving the seasonal Portsmouth-Cherbourg route. 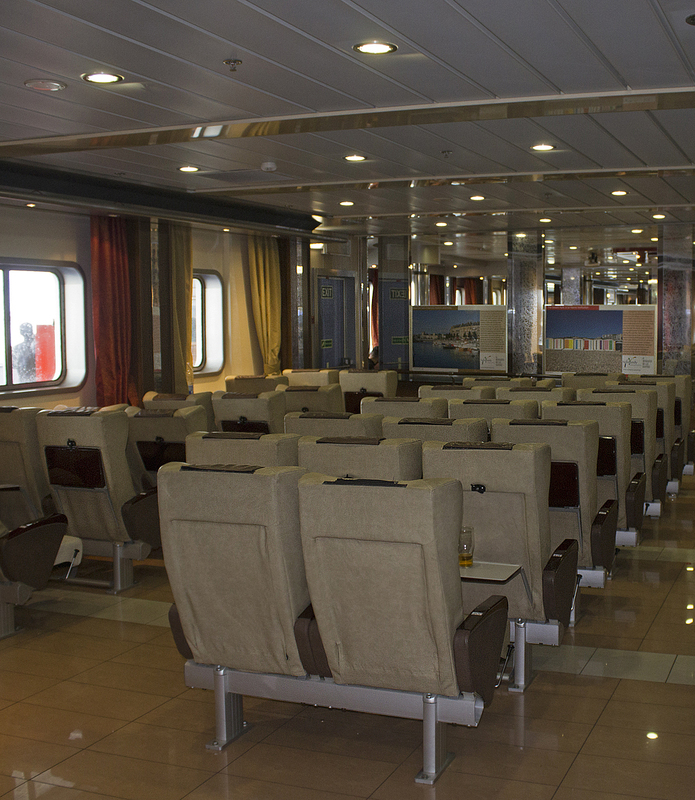 The Normandie Express features one passenger deck consisting of three main areas within the passenger cabin. 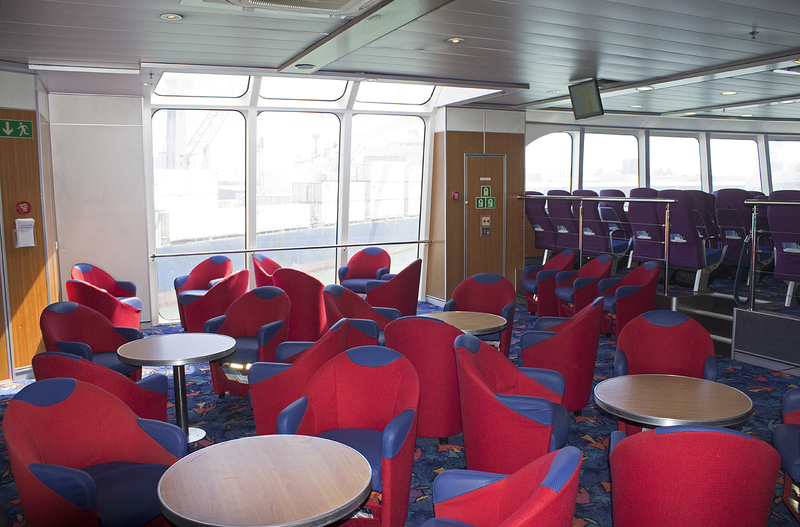 At the bow there are seating areas both port and starboard with a centrally located bar and toilet block. 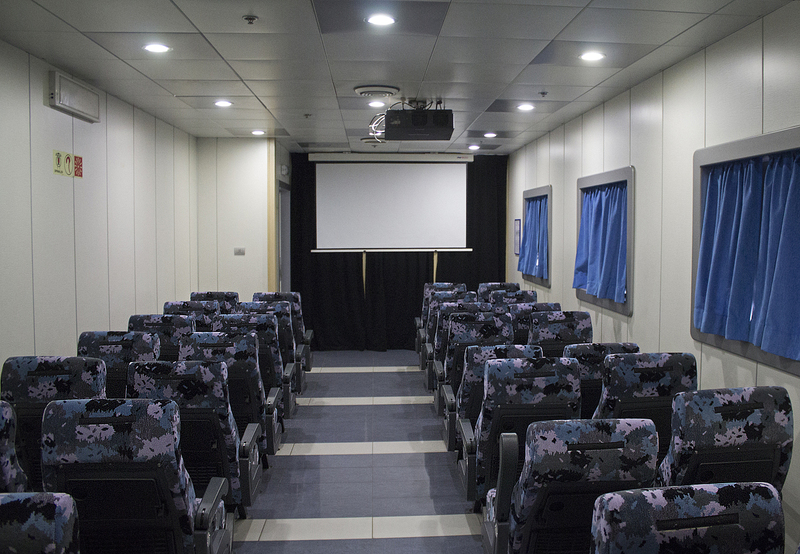 This area also features large forward facing panoramic windows which wrap around the cabin. Also located at the bow is a ramp leading to the car deck. 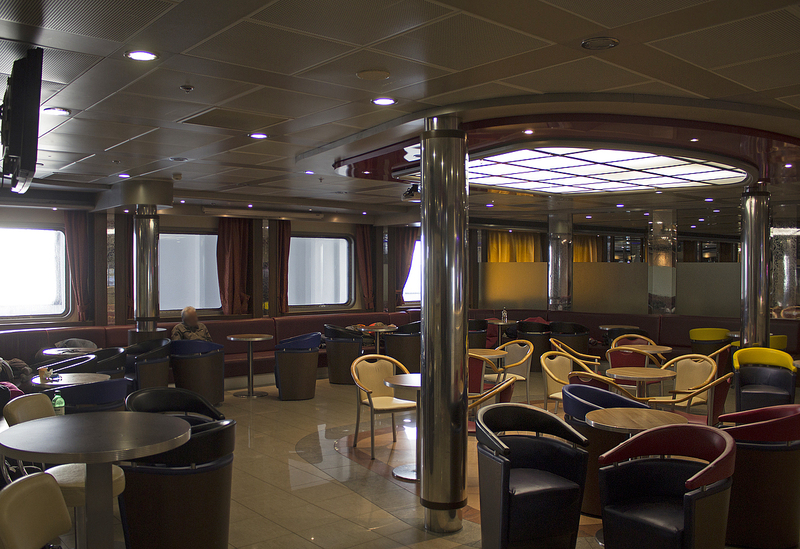 Most of the seating in this area is fixed forward facing rows, however, just astern of this area the seating is arranged in fixed tables with four fixed tub seats surrounding them. 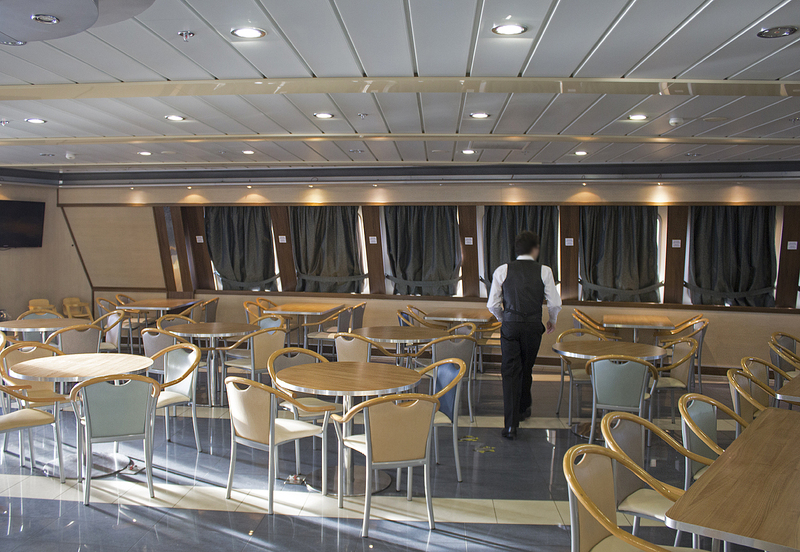 Moving astern to the midships cabin we find a centrally located shop with seating arranged in fixed tables and fixed tub seating. This area of the vessel is very light and airy thanks to the use of large windows and two large skylights which flood the area with natural light. 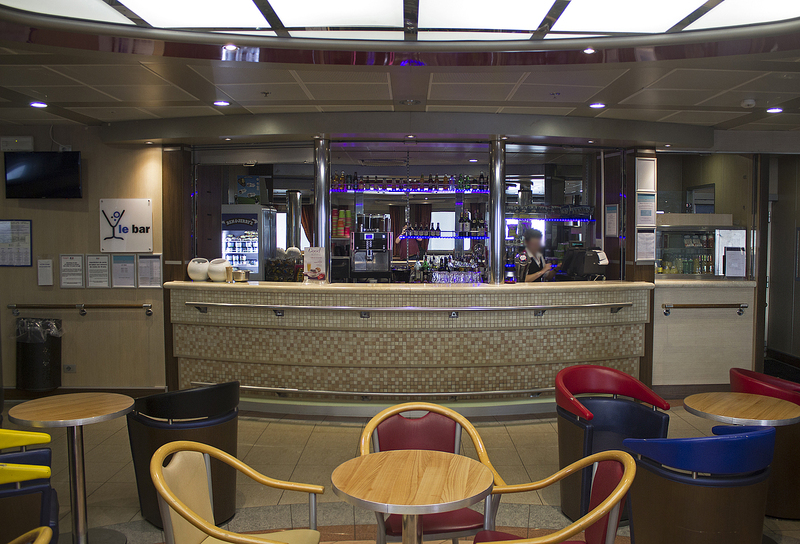 Directly opposite the shop on the other side of the midships cabin we find a Café serving a selection of hot dishes, sandwiches, salads, pastries, snacks, cold drinks, teas and coffees. 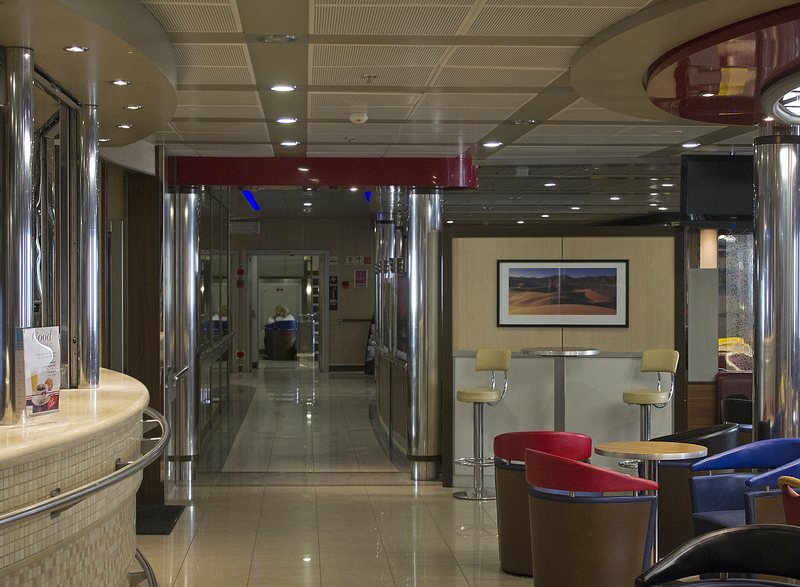 Moving astern into the aft cabin there is another centrally located toilet block with another bar/servery offering soft, alcoholic and hot beverages. 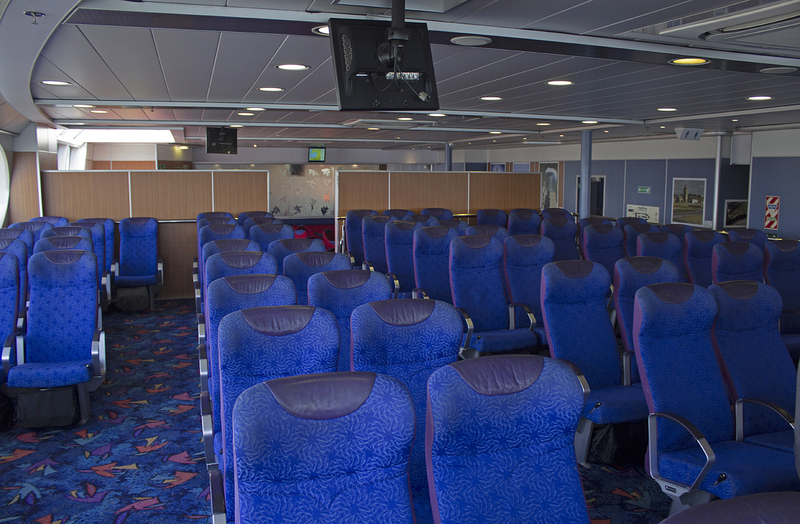 Seating here is arranged with fixed tables and tub chairs midships with rows of fixed seating in rows port and starboard. 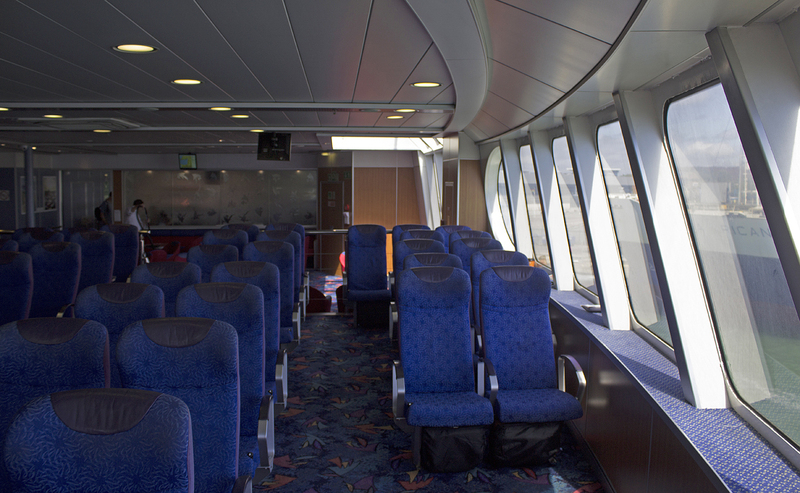 Also accessible from the aft cabin is a small outside deck area. Due to the position of the ships loading ramp this area gives somewhat restricted views astern. Earlier in the Etretat section of this voyage report I mentioned that a number of the ‘Visentini’ class vessels operate with UK, Irish and French operators and two such examples had recently arrived in Cherbourg from the Republic of Ireland, the Stena Line vessel Stena Horizon from Rosslare and the Irish Ferries vessel Epsilon from Dublin. 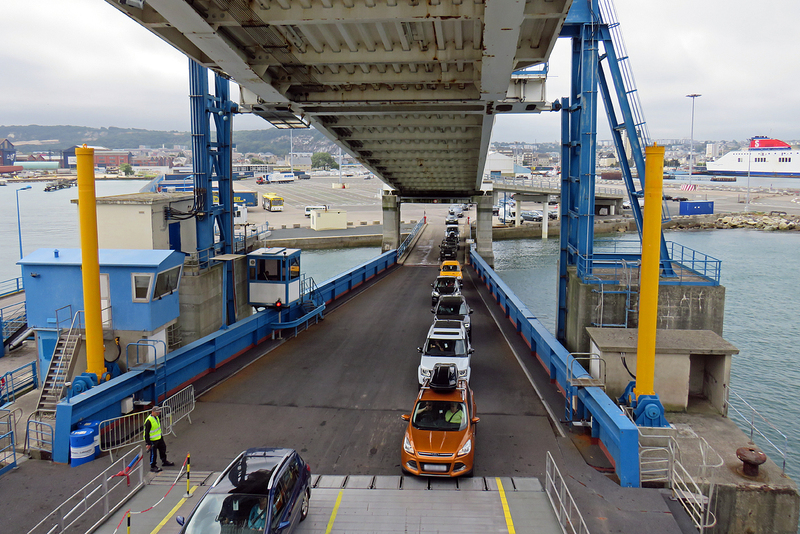 After checking in for our 12:30 sailing it was evident from the number of vehicles waiting to board the vessel that this would be a fairly busy crossing. The Normandie Express is a stern only loader with traffic boarding using a U-turn system. To say it was rather tight on the car deck would be an understatement, I am of a relatively thin build and I had some difficulty getting out of the passenger seat of the car due to our proximity to the bulkhead, something I haven’t experienced since loading trials in Poole on the Condor Ferries vessel Condor Liberation. It’s worth noting that the Normandie Express cannot transport large vehicles and trailers (including caravans). 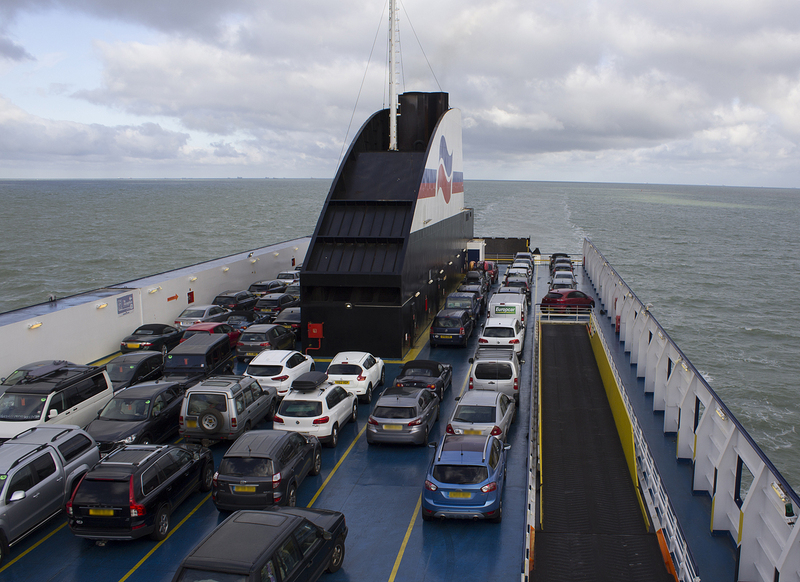 Maximum vehicle dimensions are 4m high and 9m long and all vehicles over 2.2m high have to be reversed on board the vessel. Once in the passenger accomodation we headed towards the aft cabin near to the outside deck for the duration of our 3 hour crossing to Portsmouth. This was the first time I had travelled on a single decked Incat built craft since the 74 metre variants were introduced by Hoverspeed at Dover in the early 1990’s. 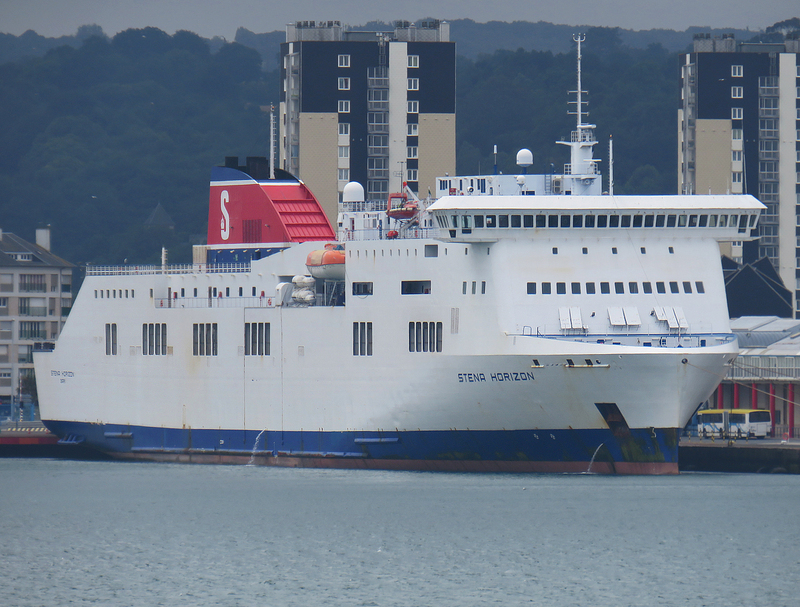 Later Incat craft to operate from Dover such as the Seacat Diamant, Seacat Rapide, Stena Lynx II, Stena Lynx III and the SpeedOne all had there passenger accommodation laid out over two decks. 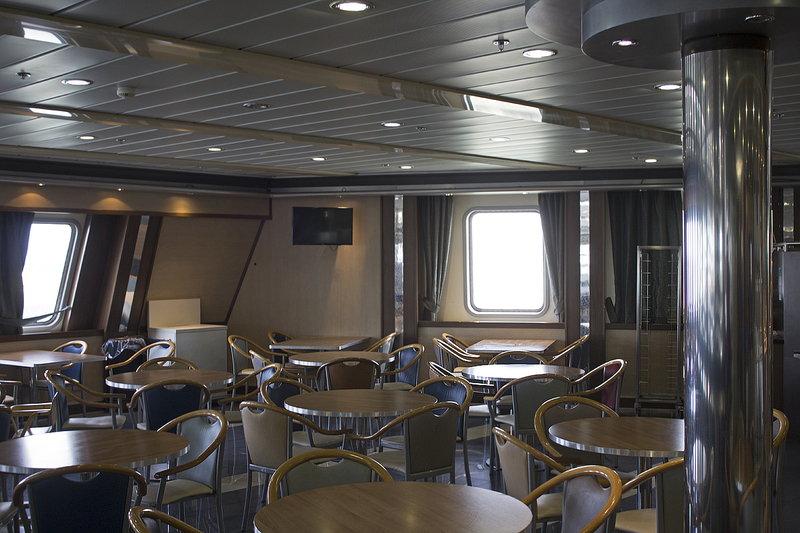 The open plan nature of the vessel certainly made a pleasant change with lots of use of colour and natural light flooding in through the abundance of windows. Although the vessel was quite heavily loaded the passenger accommodation didn’t feel overcrowded and it was still very easy to navigate around the craft. We departed Cherbourg on time for our journey to Portsmouth under a darkening sky and a noticeable breeze, that said the craft remained stable throughout the crossing and although I initially thought that the motion of the ship was making me suffer with a slight feeling of nausea I was to later find out that was in fact due to hunger, having not eaten since 05:00. Growing up as a child my late stepfather, himself a retired Second Officer/Relief Master with P&O, always told me that if you are feeling nauseous at sea try and eat something. He also suggested drinking orange juice, however I won’t go into details as to why. I am not sure if his worldly advice had any medical founding but it has always worked for me over the years so with this in mind I headed to the midships Café to see what was available. This being a lunchtime crossing I opted for the Express Menu which consisted of a Sandwich (or Salad), a chocolate bar, a muffin, a packet of crisps and a soft drink, all for £6.15, which I thought was good value, especially when compared to some of the prices shortsea operators charge for food. Within 15 minutes of eating I was feeling peachy instead of peaky, once again that greatly missed mans words of wisdom were correct and absolutely no orange juice was required. 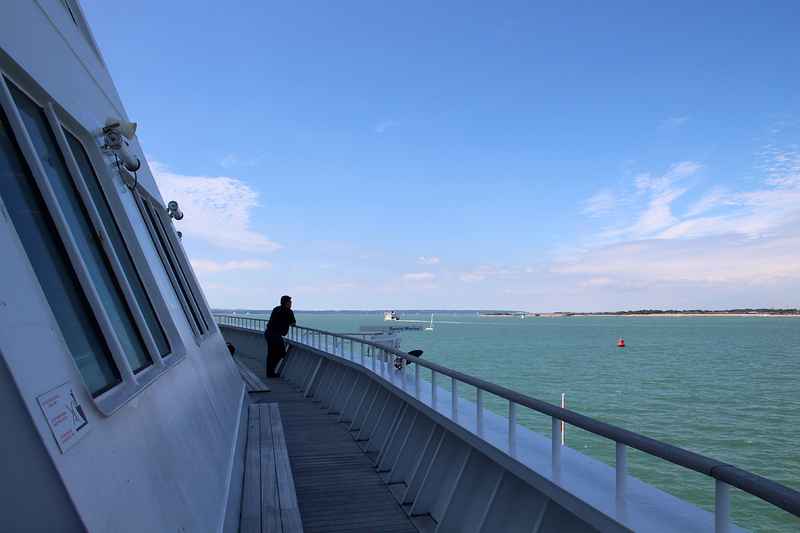 I have to say I couldn’t believe how quickly the journey passed and all to soon we were entering the waters of the Solent on approach to Portsmouth harbour. The weather at this point couldn’t have been any different from that experienced in Cherbourg just three hours earlier, it was bright, sunny and very warm. 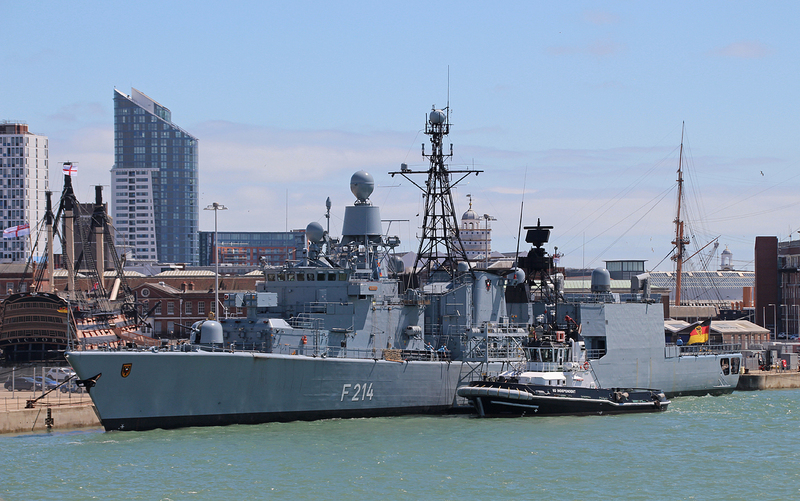 As Portsmouth approached it was time to head on deck for a little bit of photography. 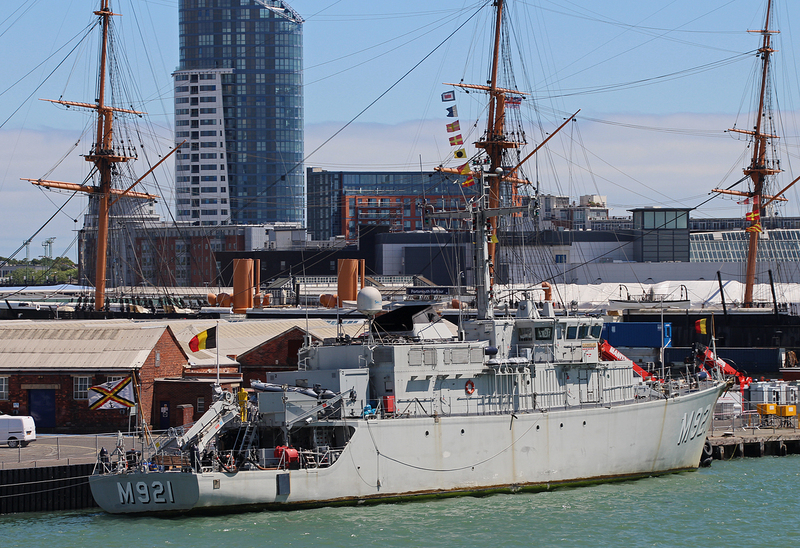 Having negotiated the transit through Portsmouth harbour past the naval base we were on our berth at 13:30 and disembarkation quickly followed. The next leg of the voyage could wait however. It was time to have a rest and chill out for a few hours. 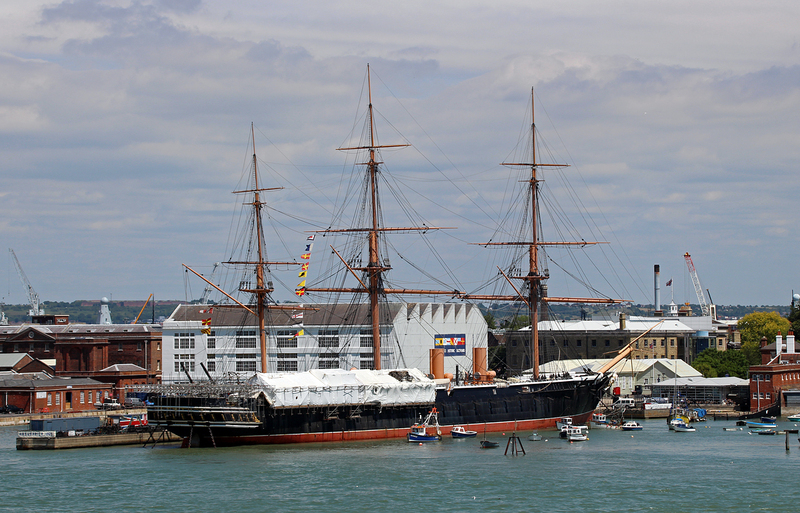 With at least nine hours to kill before the next leg of our voyage to Ouistreham we headed towards Portsmouth Historic Dockyard. I had purchased tickets earlier on in the year for a weekend visit. 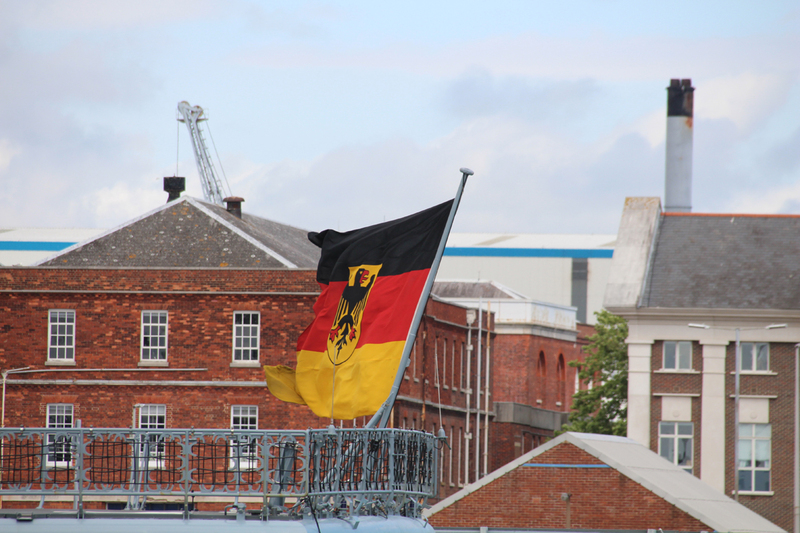 The tickets were valid for a whole year so it gave us the opportunity to do the harbour cruise and to have a look around the dockyard. 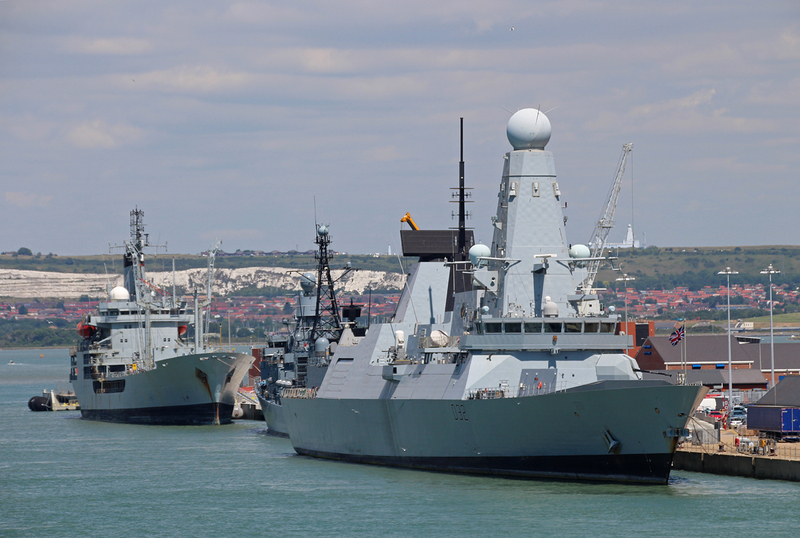 At £32 each the tickets are not cheap but when you consider you can use them as many times as you wish during the 12 month period they are good value, plus the money goes towards preserving our countries maritime heritage. 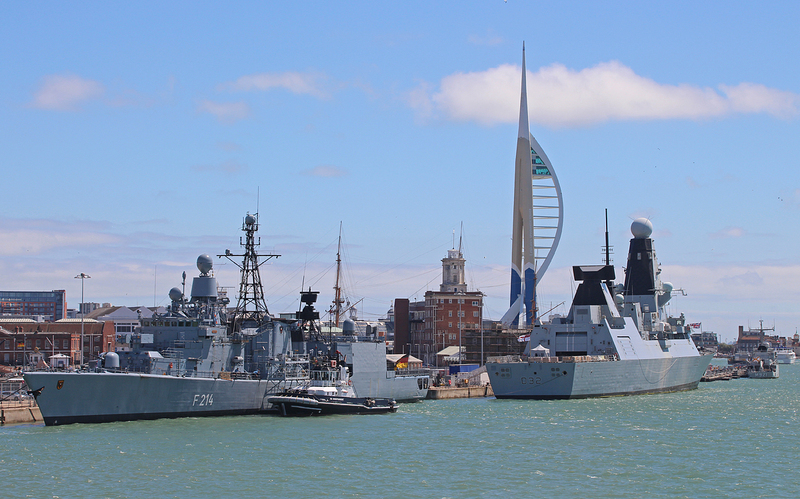 I have just recently renewed my tickets for the next 12 months as I am sure I will be in Portsmouth at least three more times this year. The Mont St Michel, named after an 8th century island commune in the département of Manche, Normandy, was built in 2002 by Van der Giessen de Noord, Krimpen aan den Ijssel, Holland for the Portsmouth to Caen (Ouistreham) route. 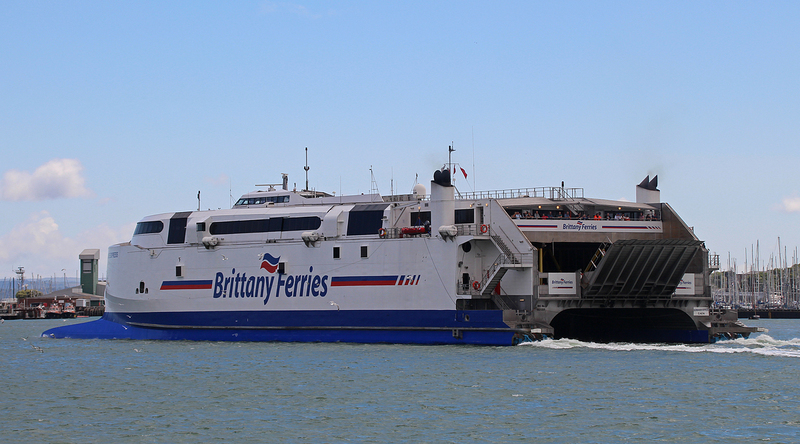 Since the introduction of the Caen routes first superferry Normandie in 1992 there had been an imbalance in the service offered on the route due to the capacity of the two vessels. 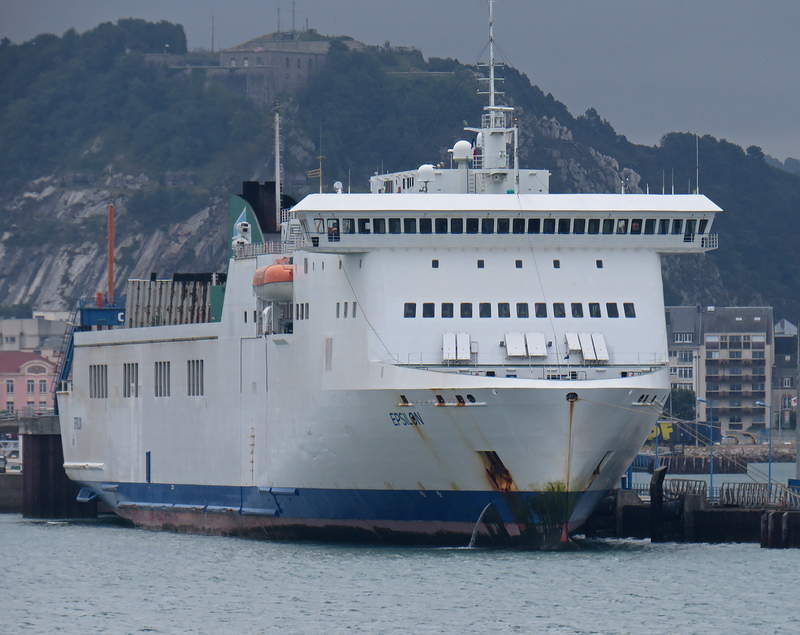 The routes original vessel, the Duc de Normandie, had a capacity of 1,500 passengers and 170 cars compared to the then new superferry Normandie with her capacity of 2,160 passengers and 680 cars. This imbalance caused some operational difficulties on the route, especially on the very popular night crossings. 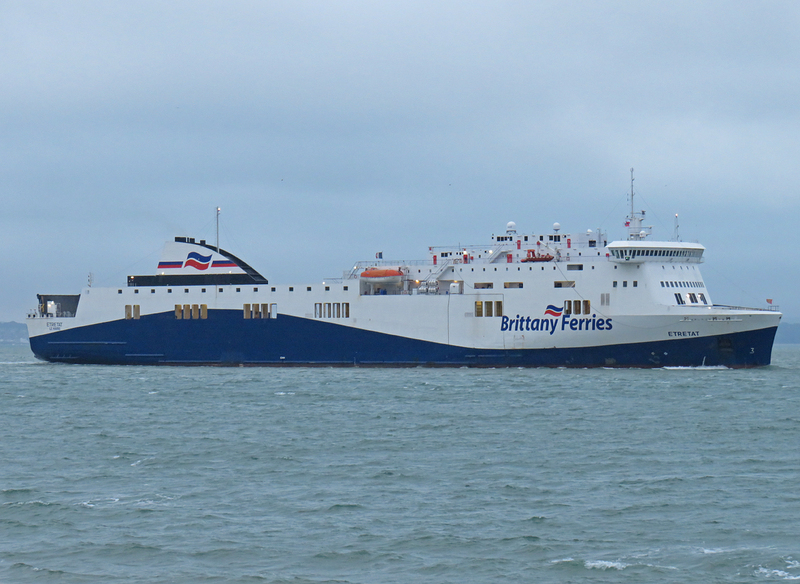 The order for the Mont St Michel would go some way to addressing this issue, as well as increasing capacity on what was Brittany Ferries busiest route on the Western Channel. The Mont St Michel was ordered on the 11th September 2000 and cost in the region of £80 million. 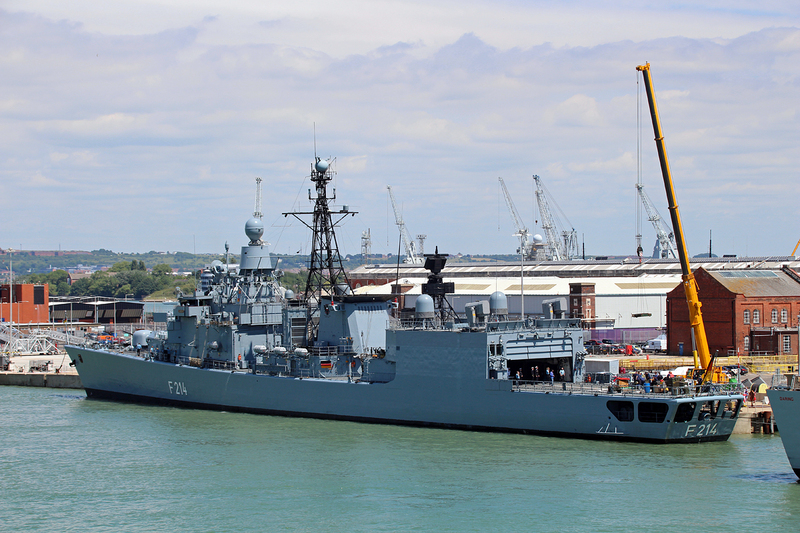 She was launched from the covered building dock at Van der Giessen on the 15th March 2002 with a planned in service date of May 2002. 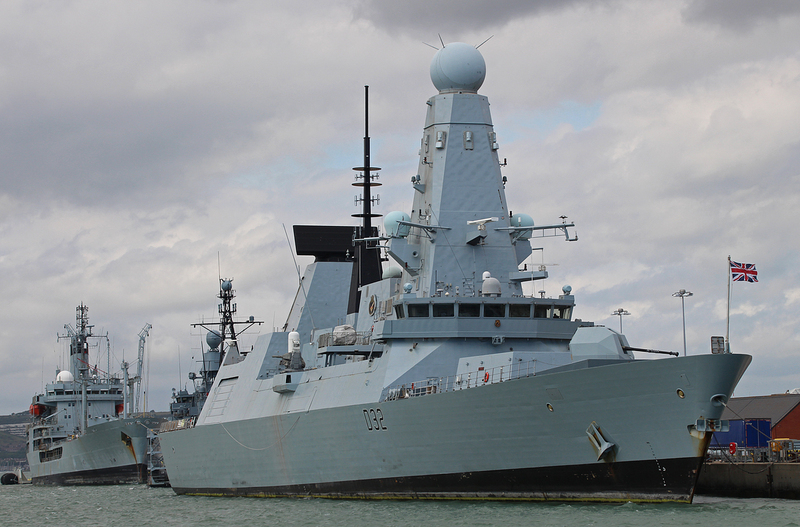 Unfortunately the shipyard were to experience a number of significant delays and this date slipped back to July 2002. Following further delays this date slipped again and the ship missed the 2002 peak summer season. 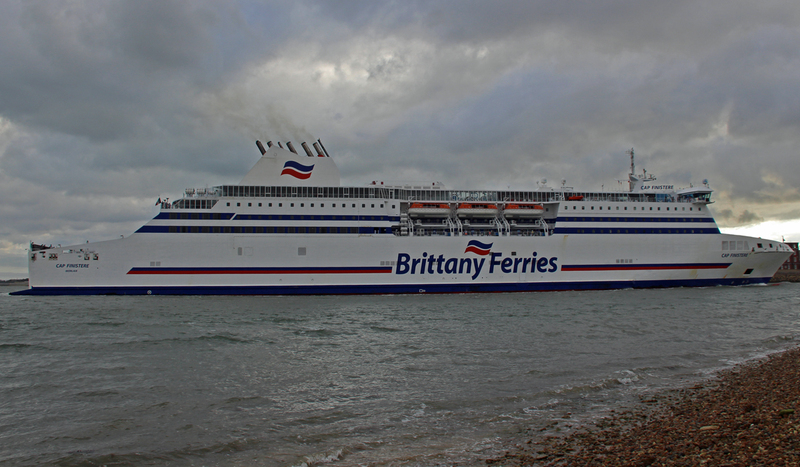 Following successful sea trials in the North Sea the ship was eventually delivered to Brittany Ferries in December of 2002. 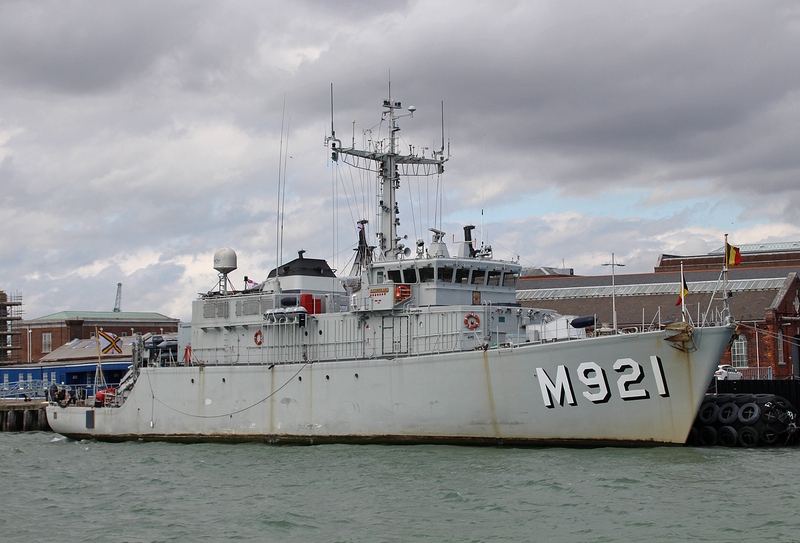 The Mont St Michel departed Rotterdam for her homeport of Caen on the 11th December 2002 and following crew familiarisation and berthing trials at both Portsmouth and Ouistreham she finally entered service on the 20th December 2002. Internally the Mont St Michel and the Normandie are very similar vessels, both featuring the same grand feature staircase which runs up through the center of the vessel but even though there general arrangements are virtually identical they are not classed as sisters. 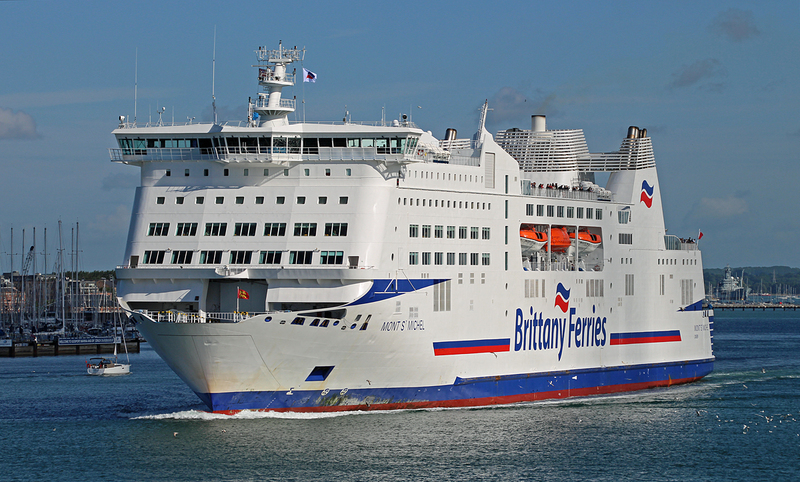 Due to new regulations in regards to limiting the sulphur content of exhaust gas emissions Brittany Ferries commenced a programme to retrofit their fleet of ferries serving on the Western Channel and in the Bay of Biscay with seawater exhaust gas scrubbers. 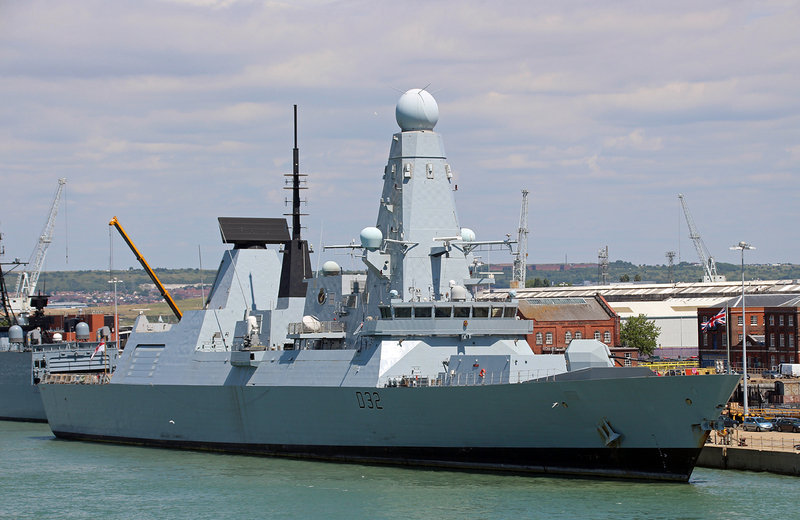 The programme commenced in 2014 and would see each vessel taken out of service in turn to receive a significant refit lasting around twelve weeks and costing around £10 million per vessel. The Mont St Michel was withdrawn from service on the 24th September 2015 and proceeded to the Astander shipyard in Santander, Spain to receive her exhaust gas scrubbing system. Due to the complexity and size of the new scrubbing system a new funnel had to be constructed on Deck 9, between the two existing funnels, to house the new equipment. 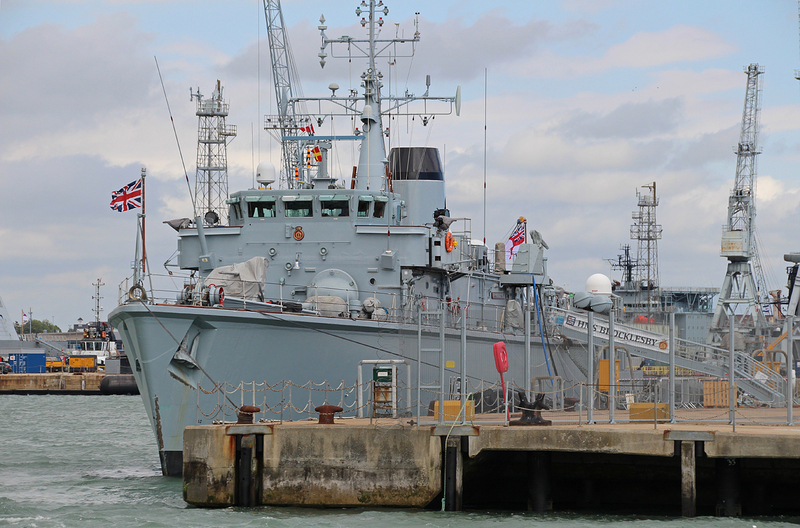 Following completion of the work the vessel departed Spain on the 8th December and returned to service on the Caen route on the 18th December 2015. 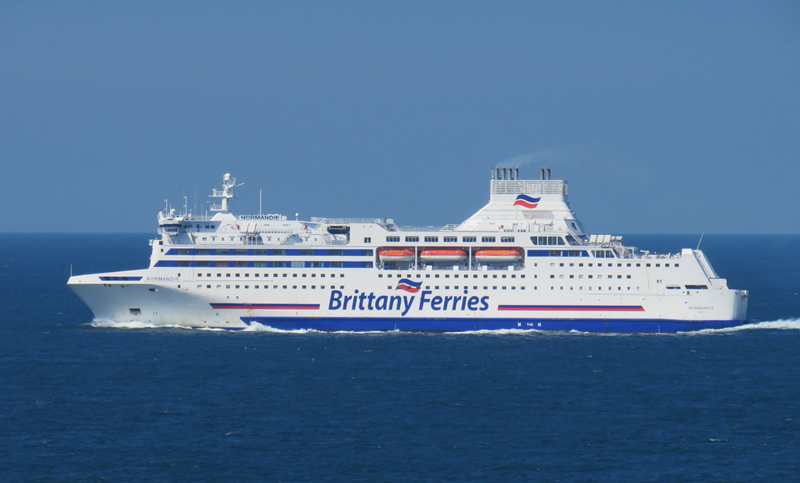 On the 15th June 2016 Brittany Ferries celebrated the 30th anniversary of the Portsmouth to Caen route. 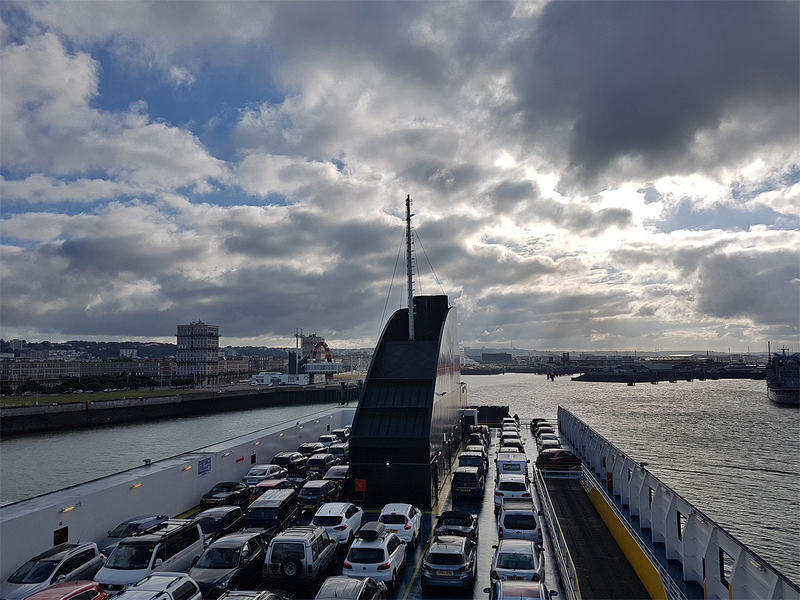 Operating year-round with three sailings per day, the route conveys around 38% of all of Brittany Ferries passenger traffic and around 55% of there freight traffic. 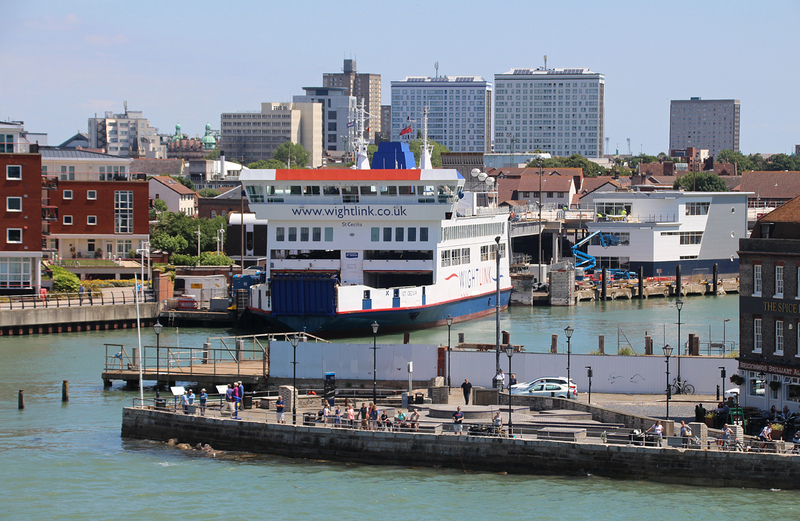 On December 21st 2016 Brittany Ferries signed a letter on intent (LOI) with the Flensburger Schiffbau Gesellschaft (FSG) shipyard in Flensburger, Germany to construct a new LNG powered vessel for the Portsmouth to Caen route for delivery in June 2019. On the 23rd June 2017 the company confirmed the order with FSG. The new £175 million vessel is to be named Honfleur and will operate alongside the Mont St Michel replacing the 1992 built Normandie. 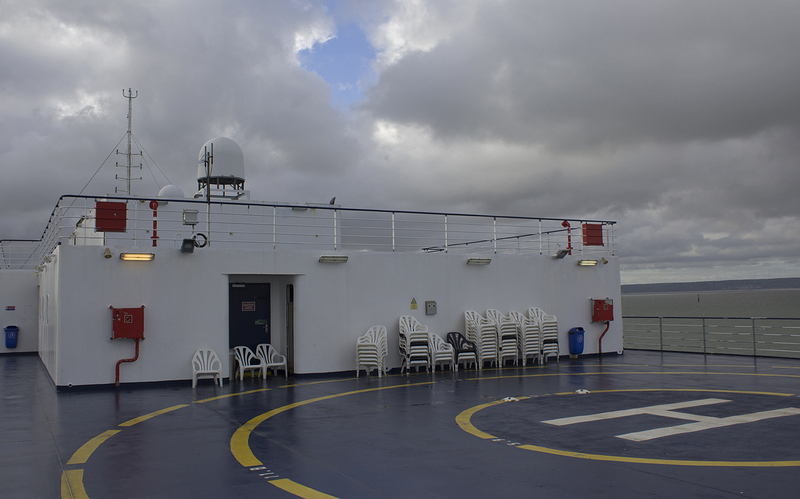 Deck 11 consists of the Helicopter landing deck and affords good views both port and starboard. 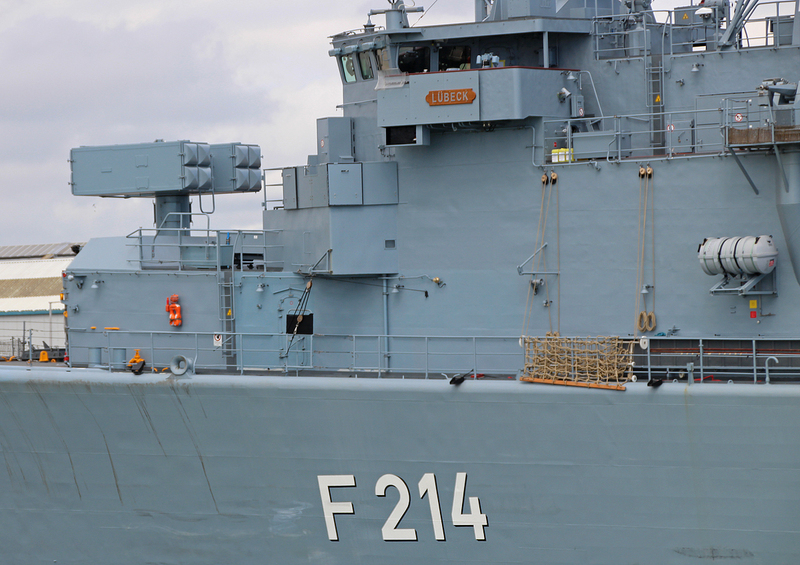 The view astern is somewhat obstructed by the vessels additional funnel located on deck 9. A number of plastic deck chairs are available for use on this deck and I have to say on a sunny day it’s a really nice spot. Heading down to deck 10 the forward section of the vessel is given over to crew accommodation. Moving astern of there is a video arcade area called ‘Games Planet‘ and another sun deck. 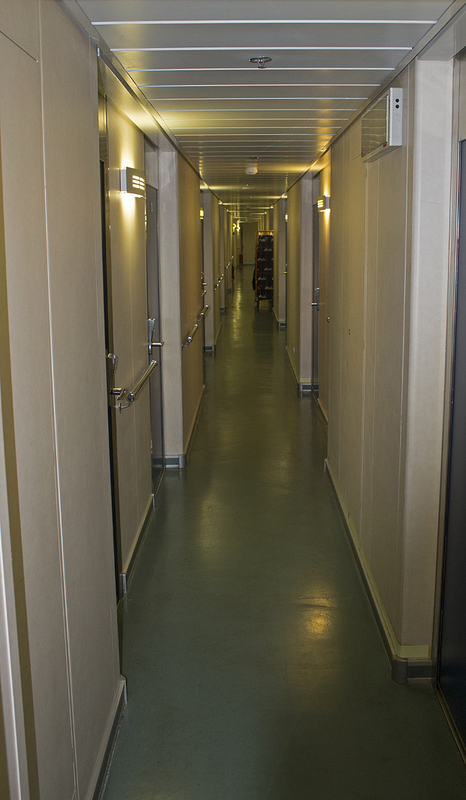 Heading down to deck 9 we have a large section of passenger cabin accommodation forward. 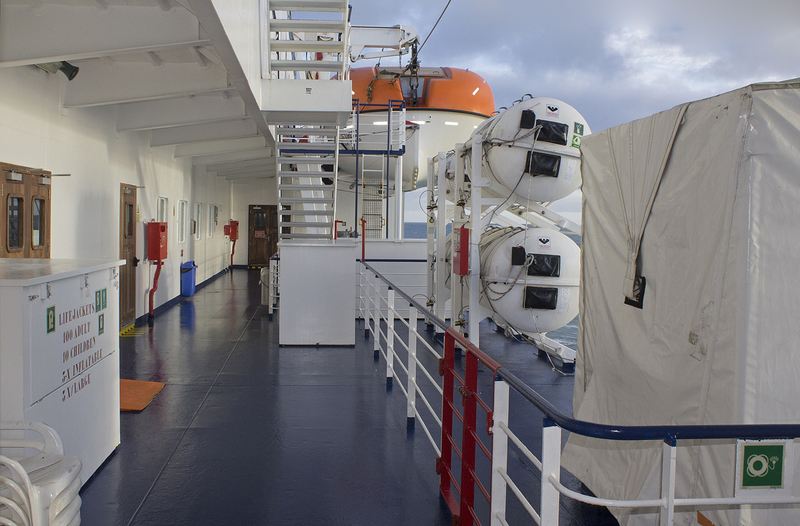 In total the ship has 224 cabins spread over two decks. 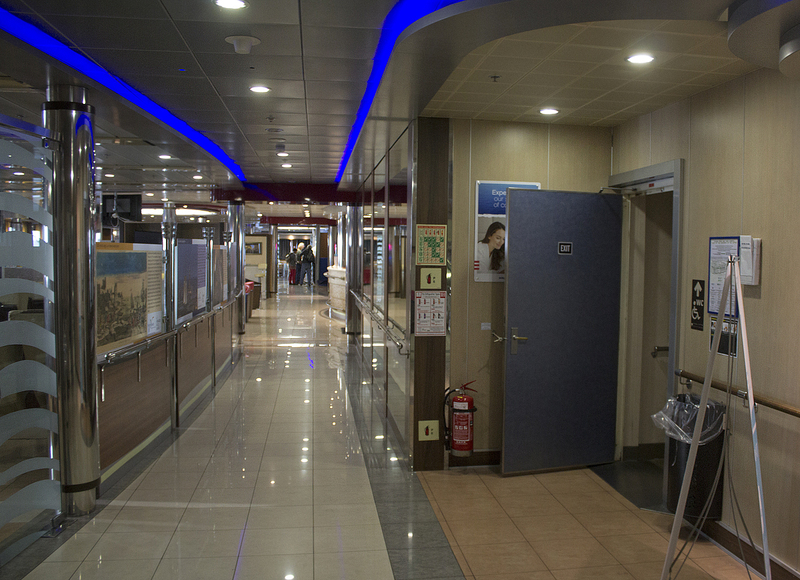 The cabins on the Mont St Michel are rather spacious when compared to some of the older ships in the fleet. Moving astern we find the ‘Blue Note Bar‘ and it’s entertainment stage, adjacent to this is the vessels signature staircase which descends through the vessel to deck 7. 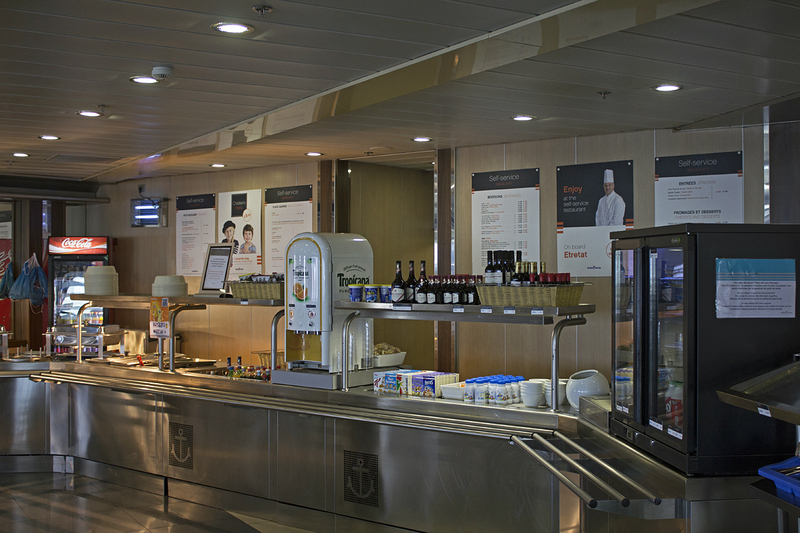 Leading astern from here we have the ‘Le Café du Festival‘ which serves a range of patisseries, cakes, pizzas, sandwiches and hot and cold beverages. In this location there is also a children’s play area. 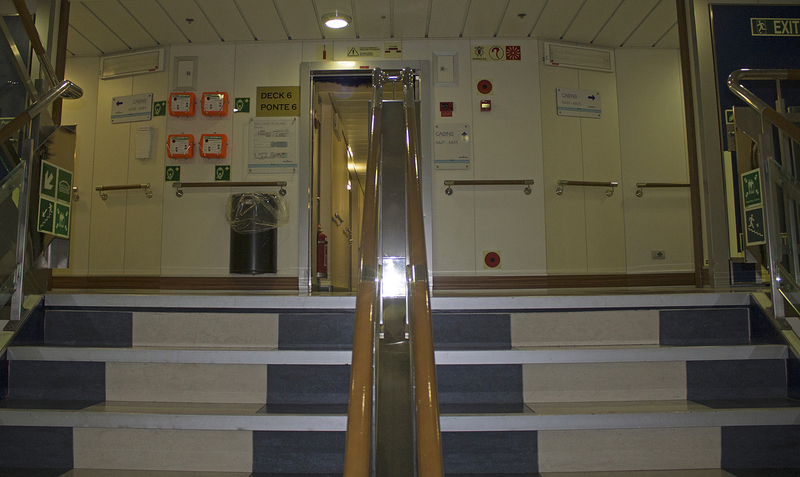 Moving astern exiting through a set of automatic doors we find another sun deck. The view astern from this deck has diminished somewhat over the years following the installation of an additional funnel to house exhaust gas scrubbers in 2015. 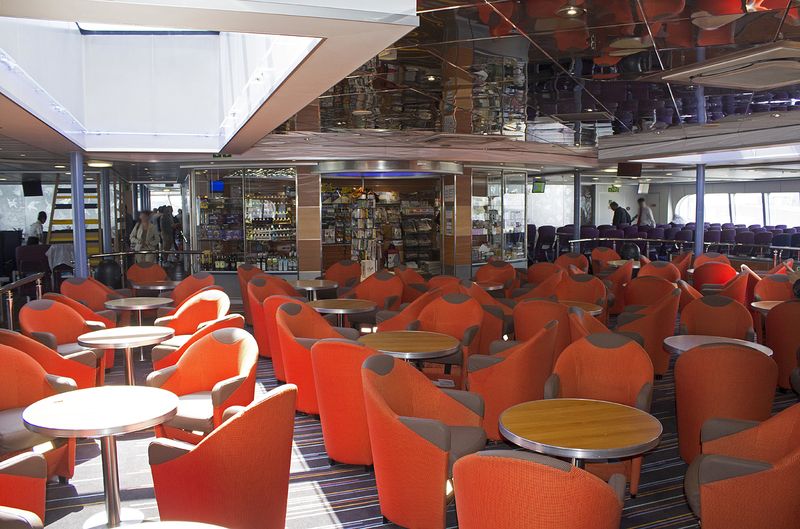 Stretching the full width of the bow of deck 8 you will find the ‘La Galerie‘ self-service restaurant which offers a large selection of hot and cold meals and great views forward. 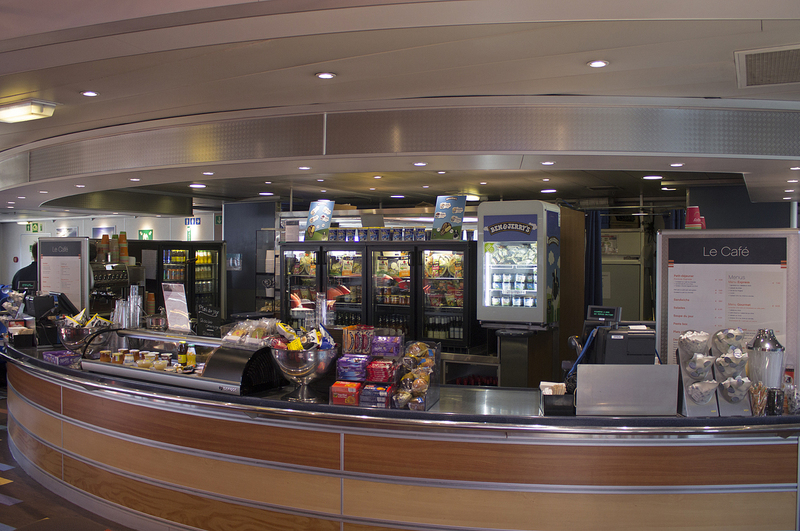 Brittany Ferries food offering in the self service restaurant is pretty good and once again reasonably priced when compared to the competition. Moving astern via the port side arcade we have two small retail units to starboard selling gifts and newspapers and the central staircase. Moving astern again we have the ‘Les Romantiques‘ a la carte restaurant which serves French cuisine for breakfast, lunch and dinner. 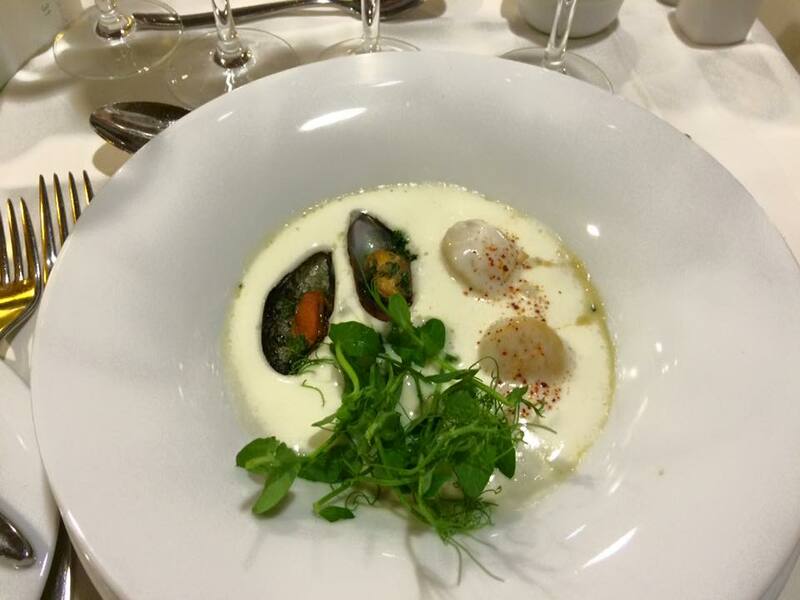 Having used the a la carte restaurants on board the Normandie, Bretagne and Pont-Aven I can highly recommend them if you fancy something a little different from the normal. 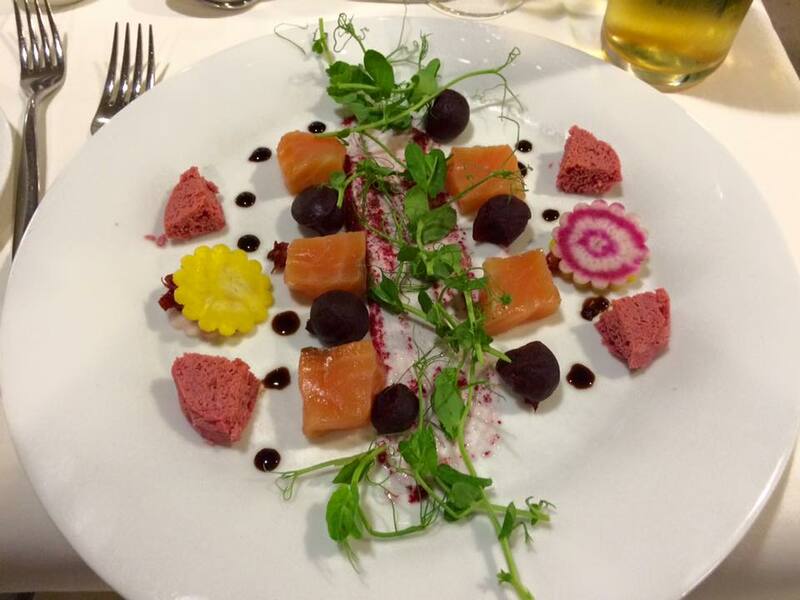 The setting and service as well as the food are superb. Aft of this is another large sundeck with fantastic views astern. 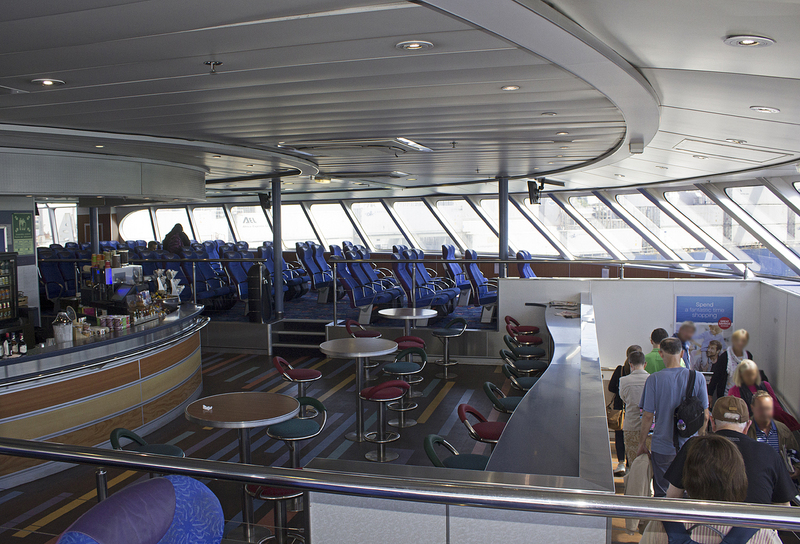 Deck 7 from bow to stern features five reserved seating lounges forward, the forward one giving great views out over the bow of the ship. 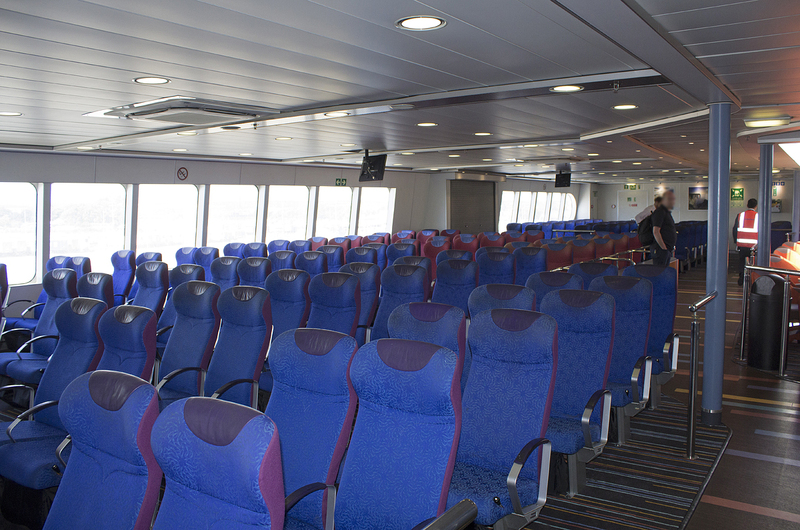 In total there are 419 reserved seats available on board the vessel. It’s worth noting that there is a small forward veranda deck forward of this lounge which is a great spot for photography. 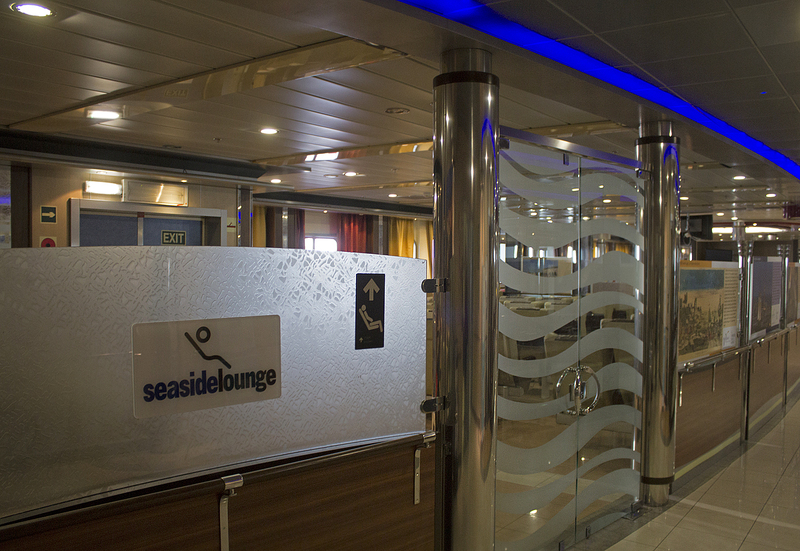 It is accessible from stairways A and B port and starboard but so not to disturb passengers in the reserved seating lounges I recommend going up to the self service restaurant on deck 8 and work your way down from there. 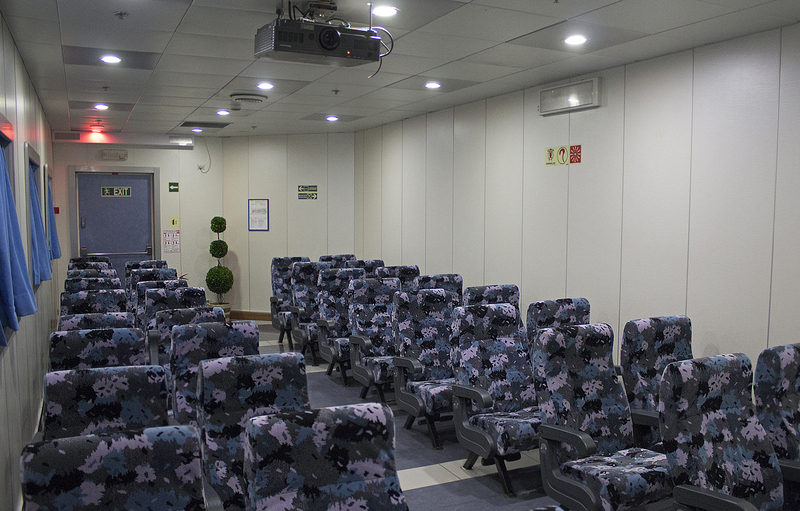 Moving astern from the reserved seating lounges there are two cinemas (port and starboard) showing the latest releases. Moving astern from here we have the large ‘Boutique‘ shop midships offering alcohol and tobacco products as well as perfumes etc. Moving astern from here we have the start of the grand staircase which leads up to deck 9. 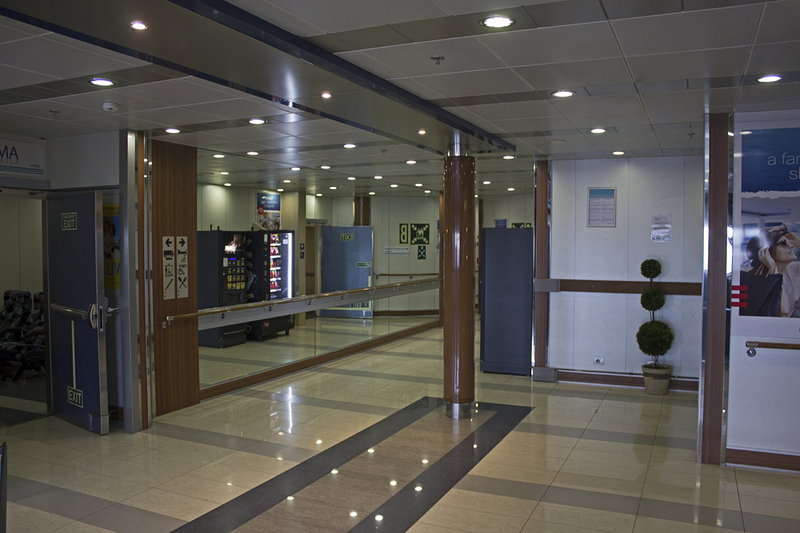 To port there is the information desk. 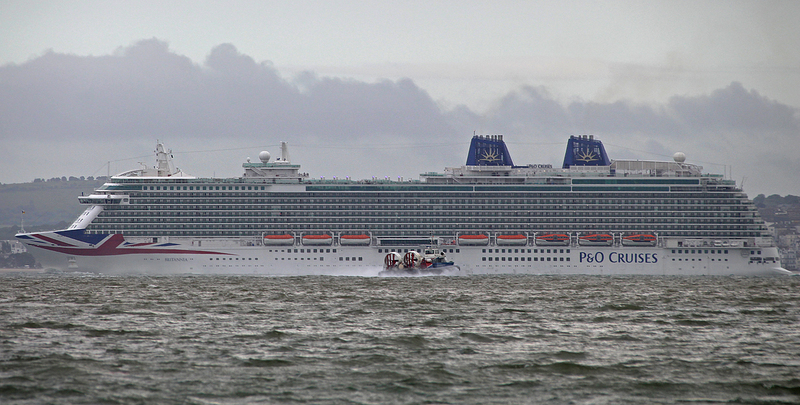 Astern of this is another large area of passenger cabin accommodation. 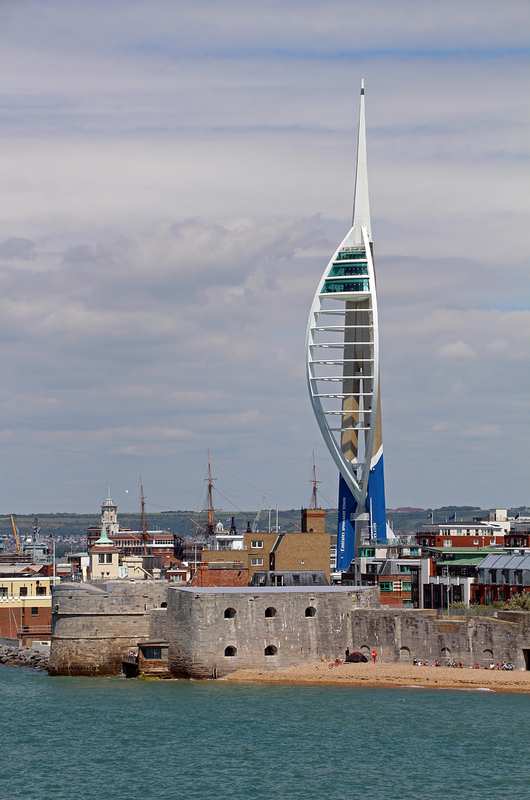 After dinner at Gunwharf Quays we headed to Portsmouth port for our third and final crossing. I will admit by this point we were both feeling a bit tired, it had been quite a busy few days with numerous early starts and with the prospect of yet another one the following day we were looking forward to the prospect of boarding and going straight to bed. We checked in for our crossing at around 21:00 and it looked as if it was going to be a relatively quiet crossing. Boarding commenced swiftly and we were soon settling down in to our cabin. After a quick refreshing shower it was time to head up on deck to witness our departure from Portsmouth, exactly 24 hours after we had last done so. After witnessing our departure it was time to head to bed. 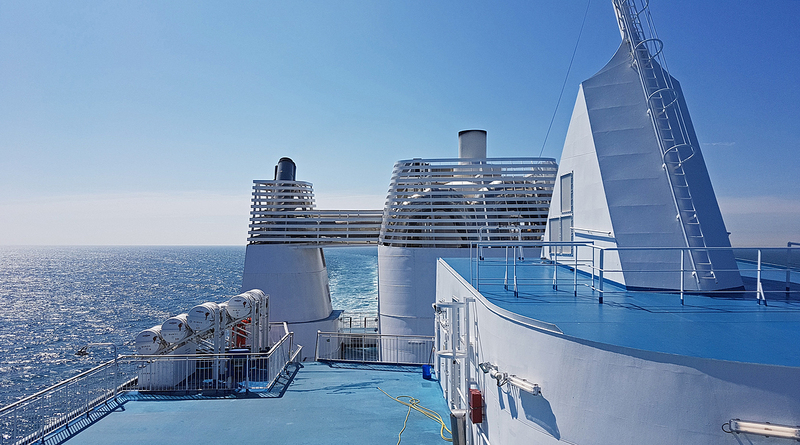 Our scheduled arrival time in Ouistreham would be at 05:45 (BST), which would mean we would start getting our gentle reminder to get out of bed and vacate our cabins at 04:45 (BST). Our arrival in Ouistreham was slightly ahead of schedule and we were actually disembaking the vessel at 05:45. After a quick drive into the Ouistreham we checked in for our 08:30 return crossing to Portsmouth. Even though this was a day crossing we had booked a cabin. As I have mentioned in previous voyage reports it’s a handy place to keep your bags, have a shower or to get your head down during the six hour crossing and at £21 was very good value. 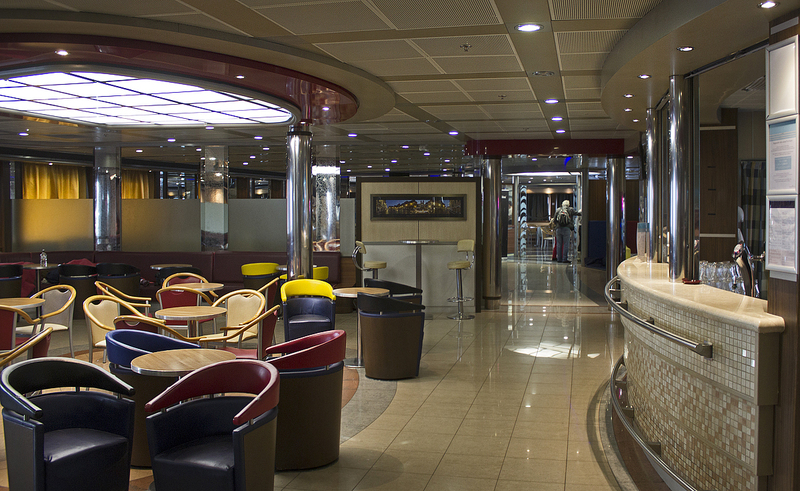 For the return crossing we decided to have breakfast in ‘Les Romantiques‘ a la carte restaurant on deck 8. The breakfast consisted of a continental buffet of fresh French pastries, cold meats, cheeses, cereals and fruit which was then followed by a small English cooked breakfast with the eggs cooked to order. After such a hearty breakfast it was time to head to bed for a few hours before our 13:15 arrival in Portsmouth. 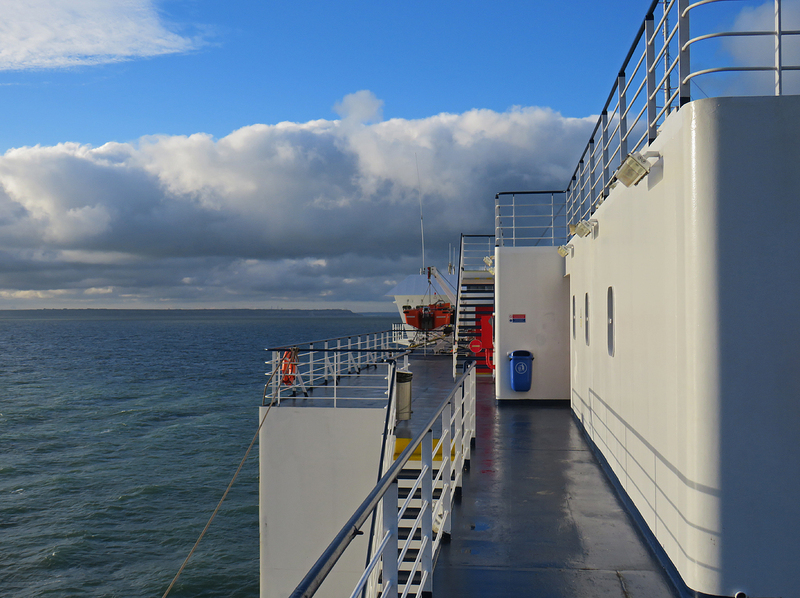 After some much needed sleep and with it being a gloriously sunny we decided to spend a few hours out on deck relaxing as we made our way across the channel. This was followed by the customary (well for us at least) Brittany Ferries patisserie and coffee and the usual arrival photography. Arrival in Portsmouth was once again on time and we were soon heading back towards Kent. 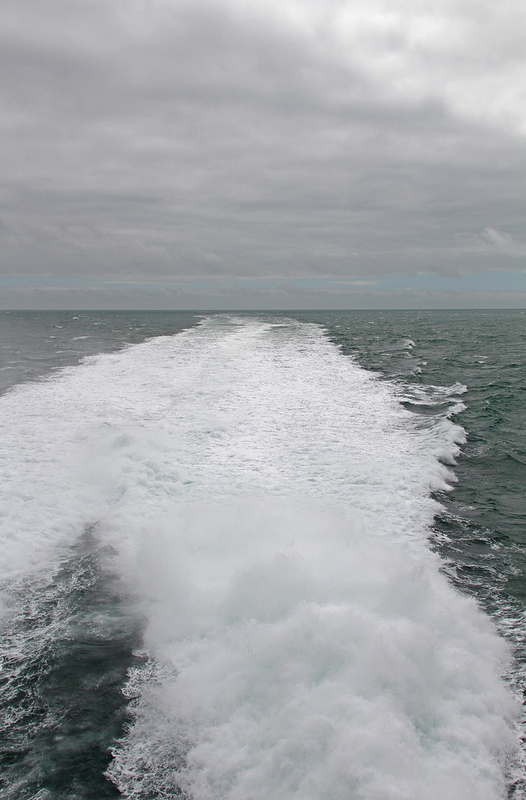 All in all it was a great way of experiencing the current fleet on the Western channel sailing to Normandy. I can see all the styles of service having a clear market. 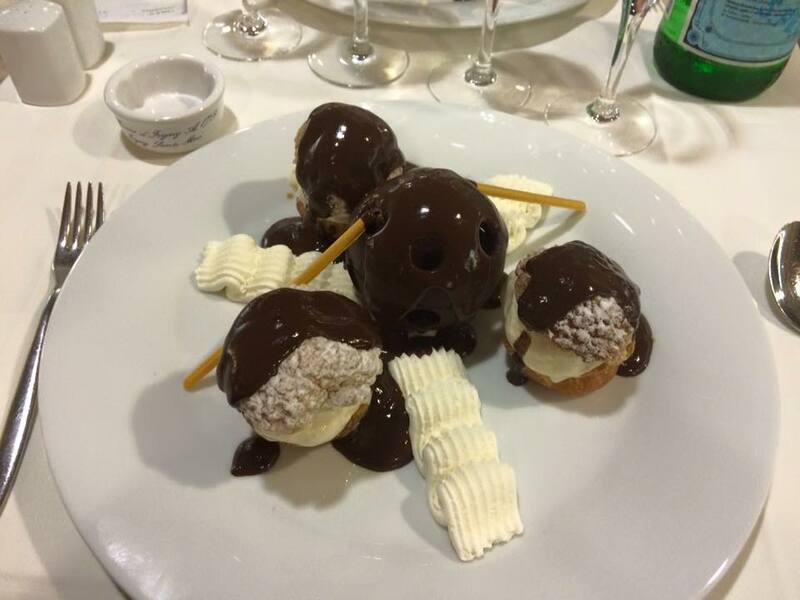 The économie service delivers exactly what it says it will. 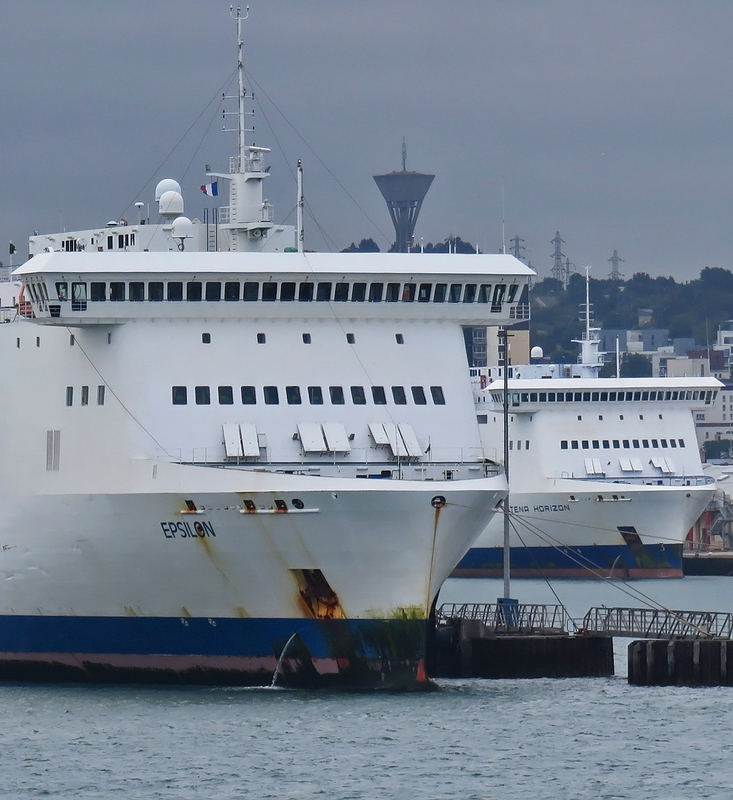 I found the Etretat to be a comfortable ship for the overnight crossing but I am not sure how she would be on the day service as most of the seating on board is geared around the night crossing. 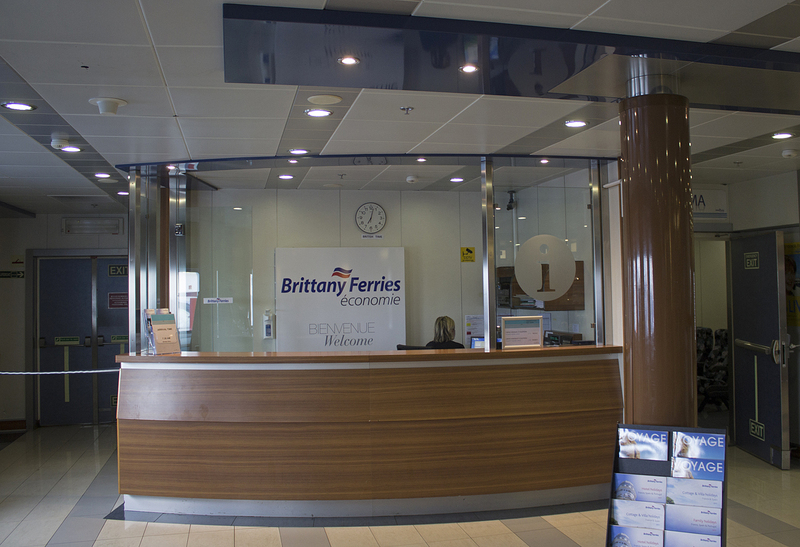 The service on board was excellent and exactly what I have become accustomed to with Brittany Ferries. I can see how the Normandie Express appeals to the market in respect of her three hour crossing time to Cherbourg compared to the six hour crossing time to Caen. If you have a young family it must be hard to keep them entertained on what could be classed as a long crossing. 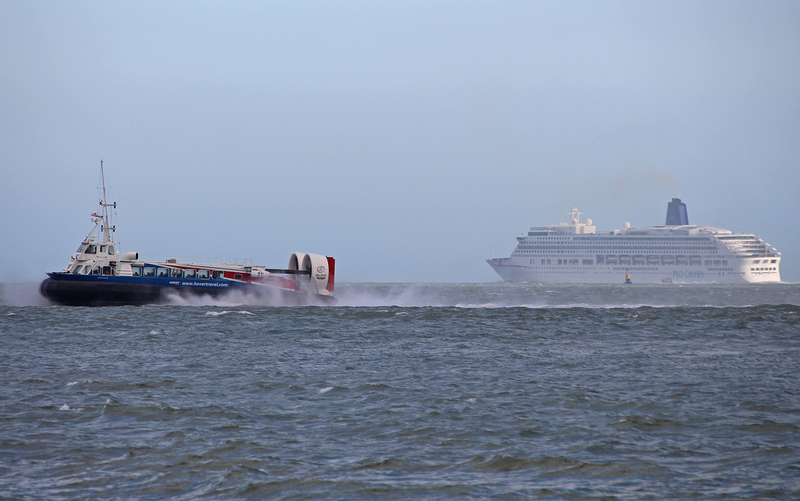 The craft also gives Brittany Ferries a degree of flexibility with increased crossings at weekends and the ability to switch between routes fairly easily. She is a comfortable ship to travel on, however I still prefer a traditional ferry. As for the Mont St Michel, she ticks all the boxes for me. My own personal opinion is that when travelling away the journey is as important as the destination. The Mont St Michel supplies everything I require in respect to comfortable modern surroundings, a good choice of food and above all somewhere I can relax and actually enjoy the crossing. 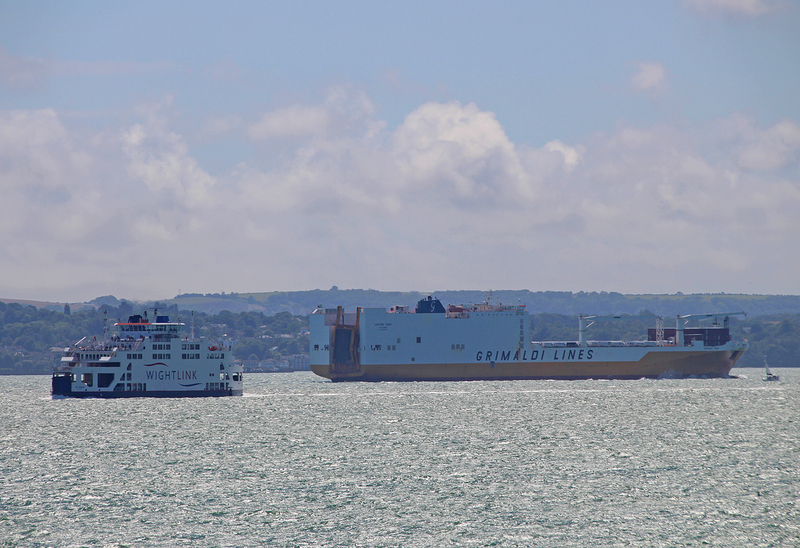 The Mont St Michel and her route companion the Normandie work well as both day and night boats. I was asked by someone on Facebook recently if I have ever worked on the ferries and they basically said I don’t really know what I am talking about, an armchair sailor was the term used. As I pointed out to this gentleman (you sir can take the term ‘gentleman’ with the intended sarcasm) I may not have worked on the ferries but my immediate family have, most of my friends do and for the simple fact that I have been travelling on them for over 30 years. Add to that I have worked in the customer service industry for over 20 years, I think I am more than qualified to give my own personal opinion on this particular field of the travel sector. Thanks for reading and keep an eye open for this armchair sailor to produce yet another voyage report in the not to distant future. I would like to take this opportunity of thanking my good friend and website colleague Paul Cloke for driving us between all of our destinations. 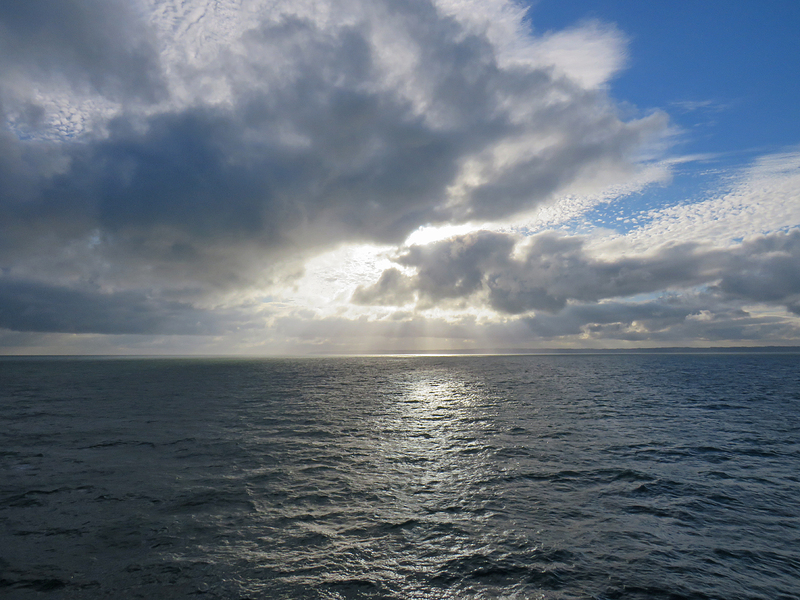 In addition I would like to thank Brittany Ferries and the crews of the Etretat, Normandie Express and Mont St Michel for making this a pleasant, pleasurable and relaxing trip to the Normandy region. All photographs on this page taken by Ray Goodfellow were produced using a Canon-EOS 700D mounting a Sigma 18-300mm lens and a Canon-Powershot SX540 HS. All photographs taken by Paul Cloke were produced using a Canon-EOS 1200D mounting a Tamron 18-200mm lens. All photographs, unless otherwise stated, are the © copyright of Ray Goodfellow & Paul Cloke (Dover Ferry Photos) 2018, All rights reserved.